I went to Nara, a smaller city south of Kyōto. 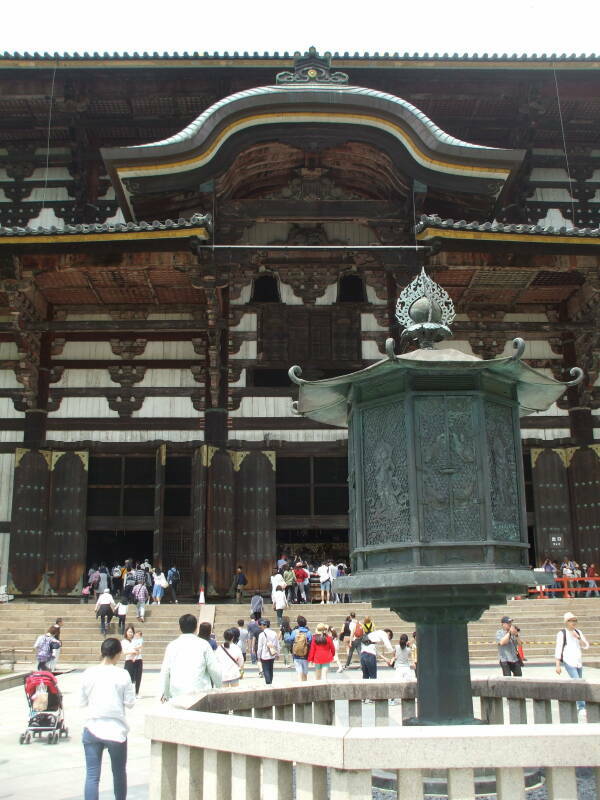 There is a lot of history there, Nara was Japan's capital from 710 to 794. 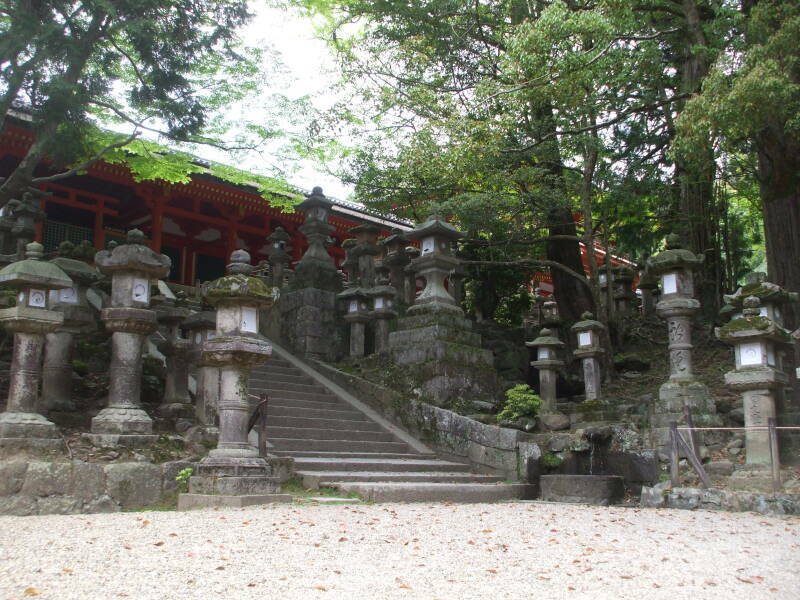 A set of eight temples, shrines, and ruins form a UNESCO World Heritage Site. 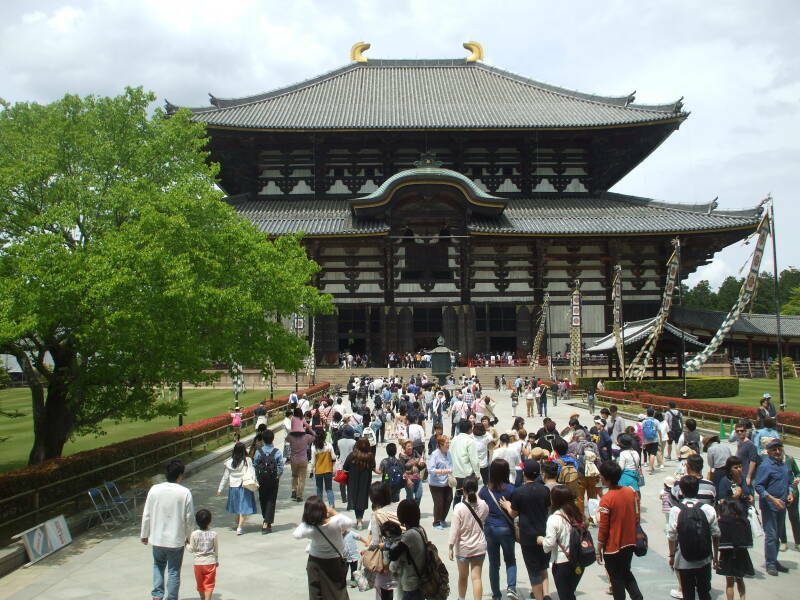 One of these is Tōdai-ji, a Buddhist temple complex housing the world's largest bronze Buddha statue in the world's largest wooden building. I wanted to see that, but I also wanted to see the kofun, the large prehistoric megalithic tombs in and around Nara. Not many people want to see the kofun, but I did. Nara is east of Ōsaka and almost straight south of Kyōto. It is close to the large city of Ōsaka, but it doesn't seem like it as a line of high hills lies in between. 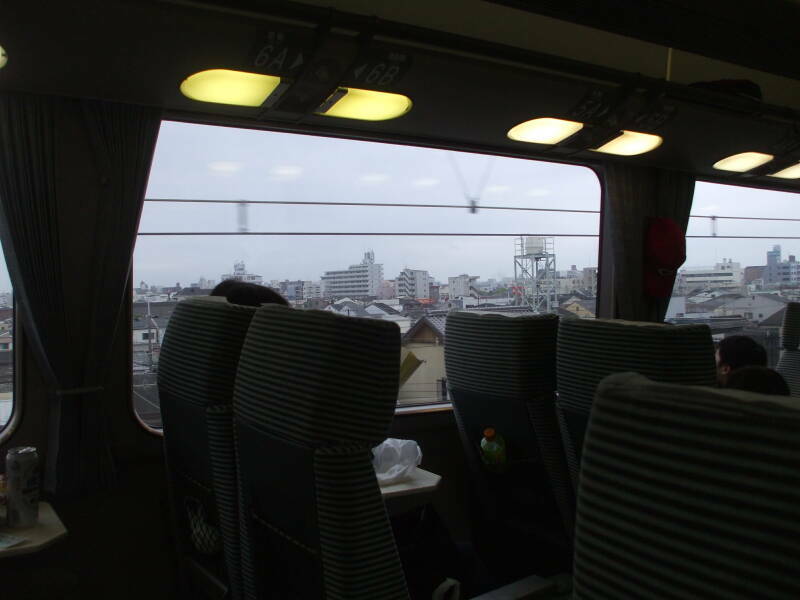 I'll stay in Nara for a few nights seeing the sights in and around that small city. 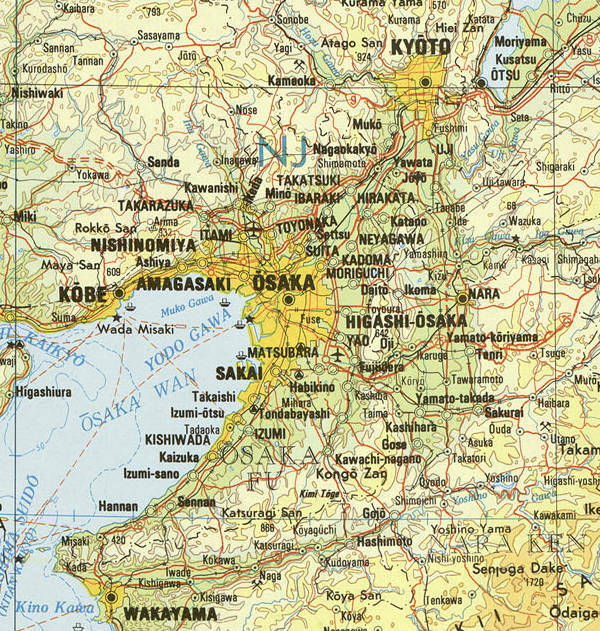 On one day I'll take a day trip south to Asuka, which you can also see on this map. 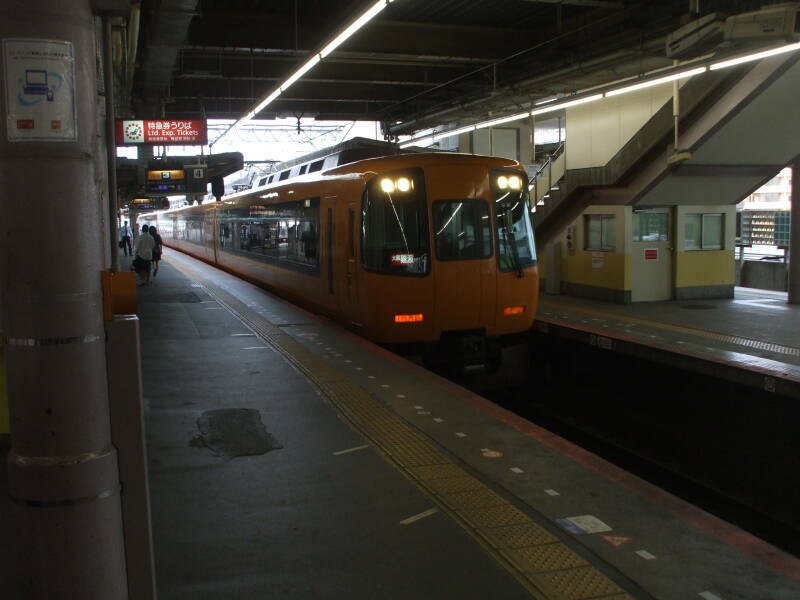 There are two train stations in Nara, one for the national Japan Railways and one for the private Kintetsu line. 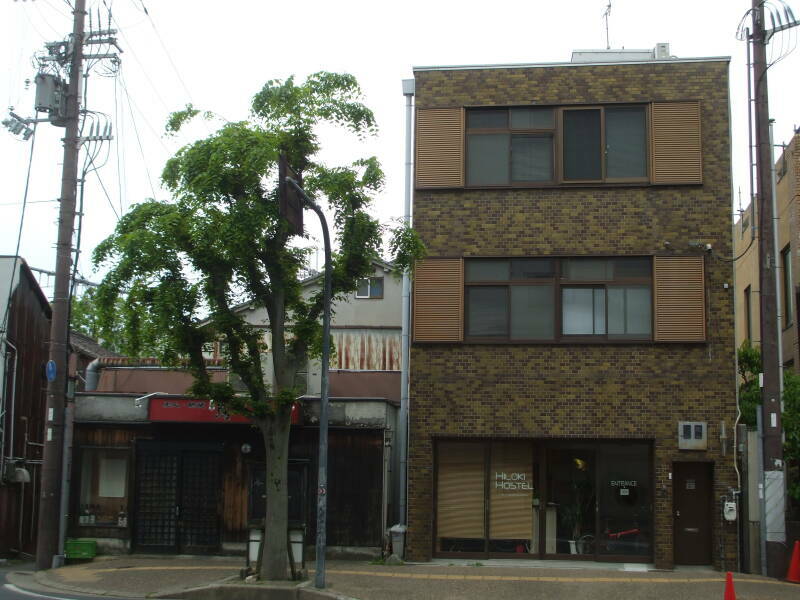 I stayed at the Hiloki Hostel, which is close to both and just a block from the Mausoleum of Emperor Kaika. From the JR station just cross to the left across the plaza in front of the station, cross Sanjo Dori, and continue north along the street. It's a clean, well-lighted place, with just one person on staff at a time. They're there only 0830-1130 and 1530-2030, so plan ahead. A bed there was just ¥2,675 a night. My host at Hiloki Hostel was very helpful. I mentioned my peculiar interest in seeing the kofun, and he immediately gave me some local maps with details of a cluster of them northwest of the city. 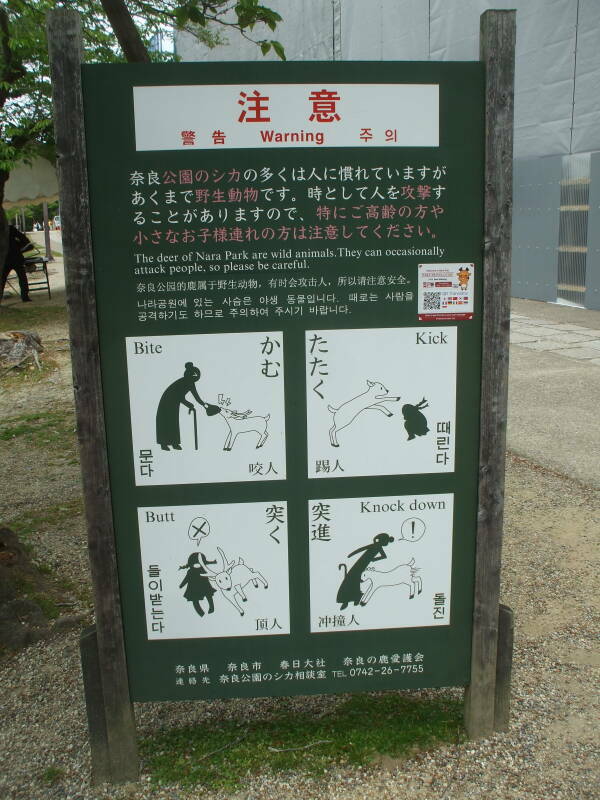 Plus, of course, lots of information on more conventional things to see in Nara. 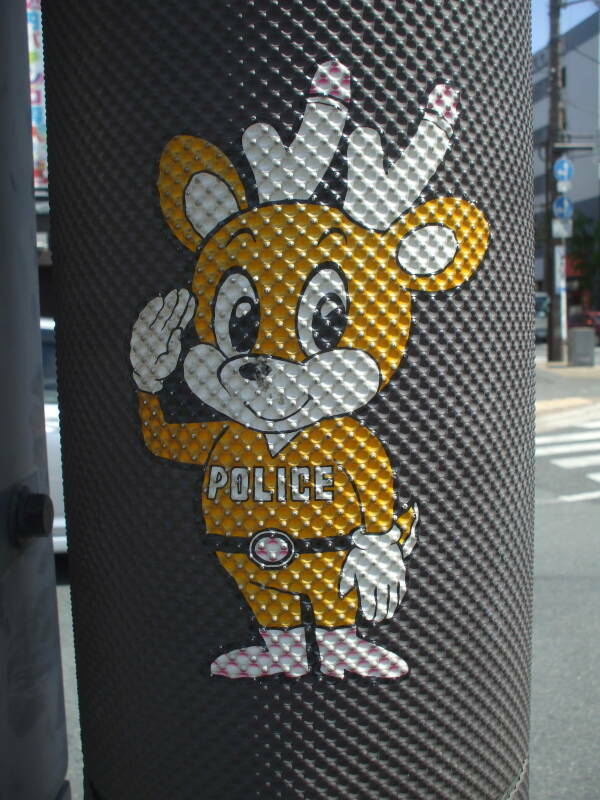 The sika deer are a symbol of Nara. 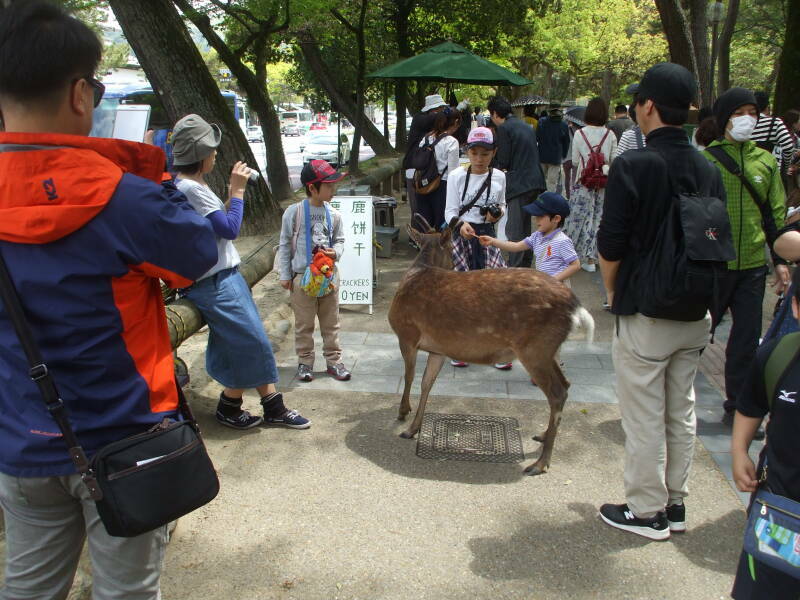 The local tourist bureau has emphasized them, as the deer fit into the national craze for kawaii or extreme cuteness. Sika are one of the few deer species that do not lose their spots when they mature, so they even retain a partially immature appearance. Oh, so much more kawaii! Can you enrage a Buddhist? It may be difficult, but it is possible. 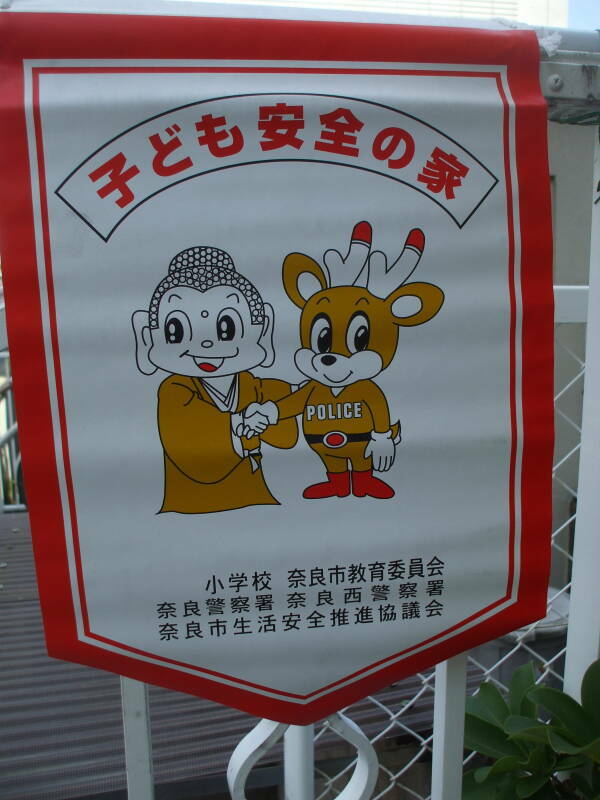 For example, adding antlers to Buddhist figures can do it. 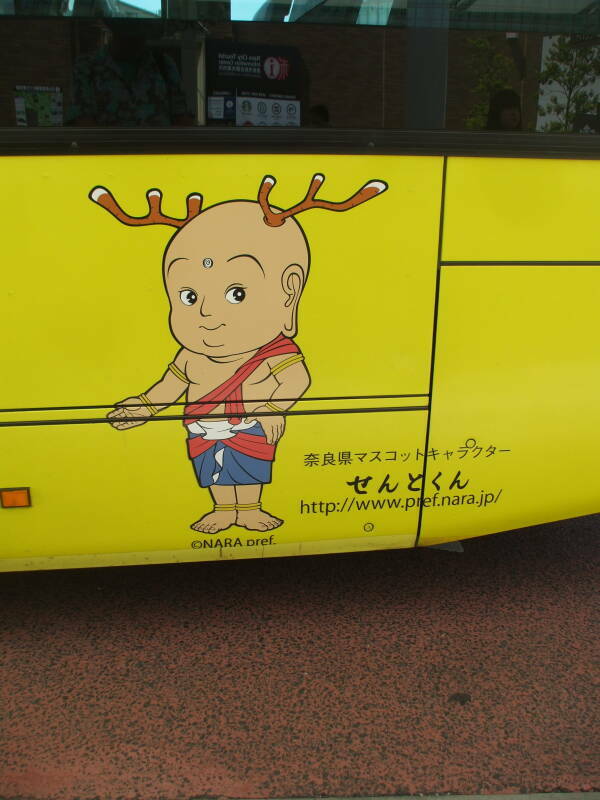 The marketing program that added this decoration to city buses has been very unpopular with many locals. The local law enforcement community patiently tolerates being dragged into the kawaii mania. 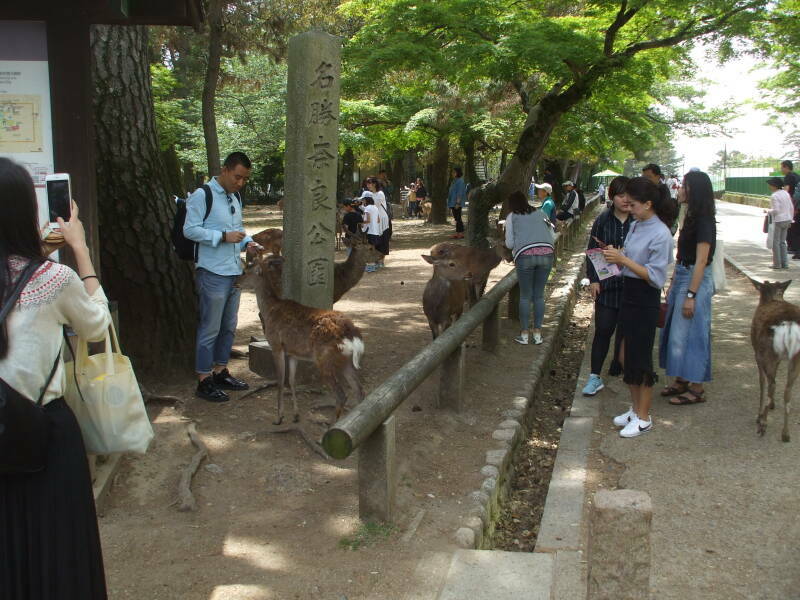 There are more than 1,200 sika deer in Nara, where they are considered sacred. 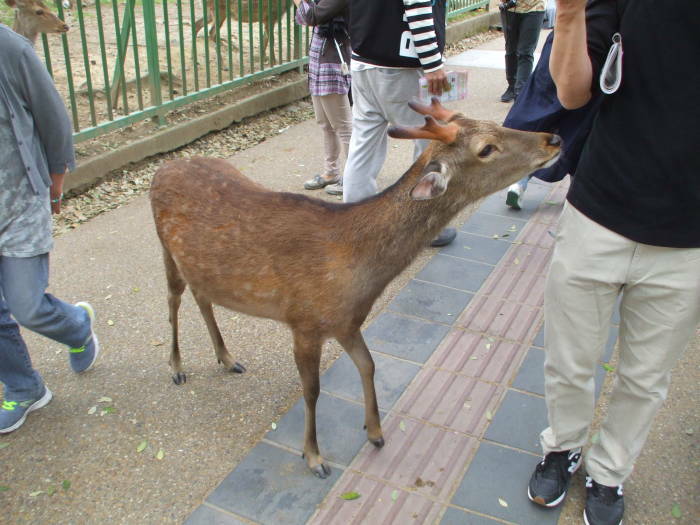 The deer are believed to be messengers of the Shintō gods that inhabit the Kasuga-taisha shrine and surrounding mountains. The Shintō god Takemikazuchi is said to have arrived here riding a white deer, back when this was the new Japanese capital of Heijō-kyō. 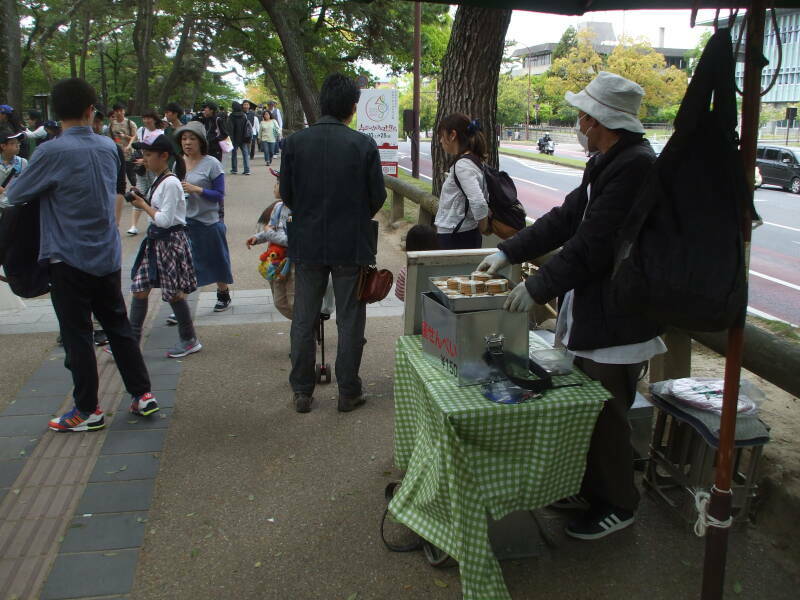 Vendors sell sika senbei, deer crackers. The deer repertoire includes biting, kicking, butting, and knocking down. People are delighted to see a deer bow. So kawaii! Many of the deer have learned that bowing gets them more crackers faster. But if you bow to a deer, it may interpret that as an invitation to a head-butting contest. 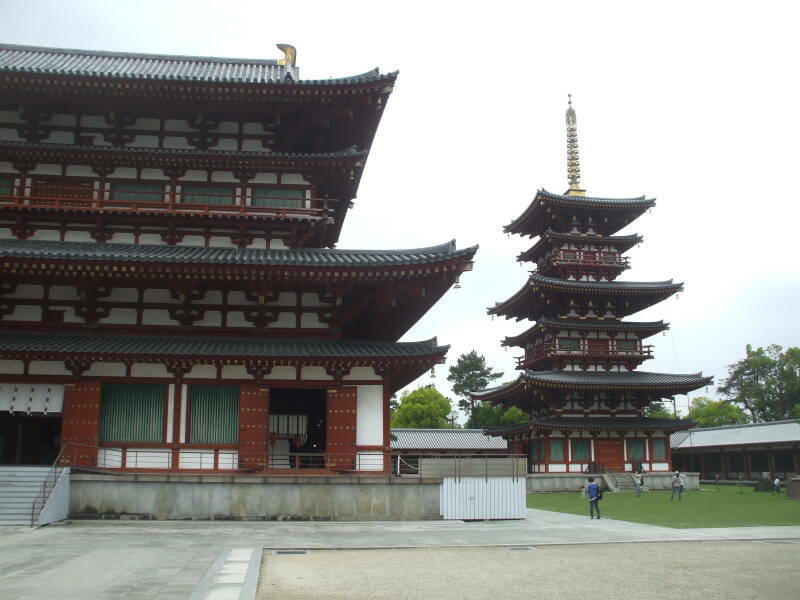 The Kōfuku-ji temple complex was built in 710. 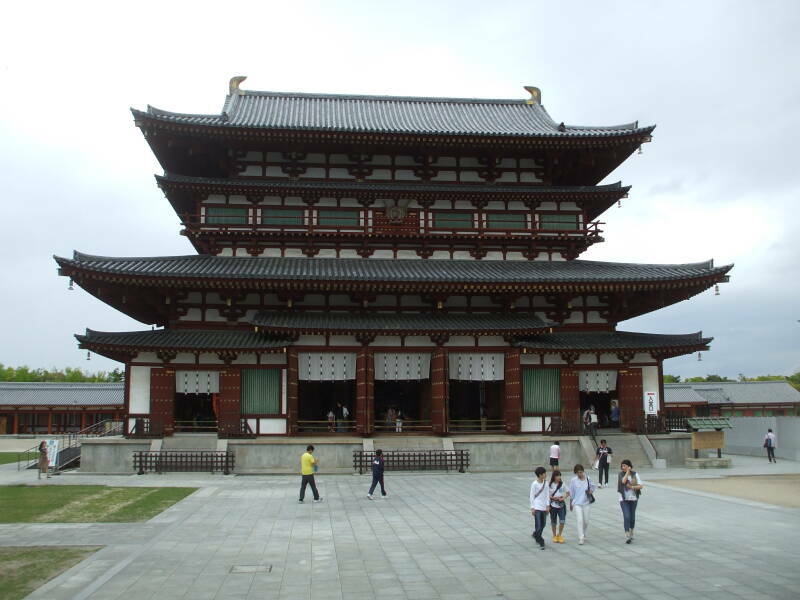 It was the Buddhist temple of the Fujiwara clan, who dominated politics through the Heian period of 794 to 1185. They married their daughters to Emperors and monopolized the regent positions of sesshō and kampaku, controlling the state. That period was the peak of power for the Imperial house, right up to when power transferred to the Shōgunate which was initially based in Kamakura. 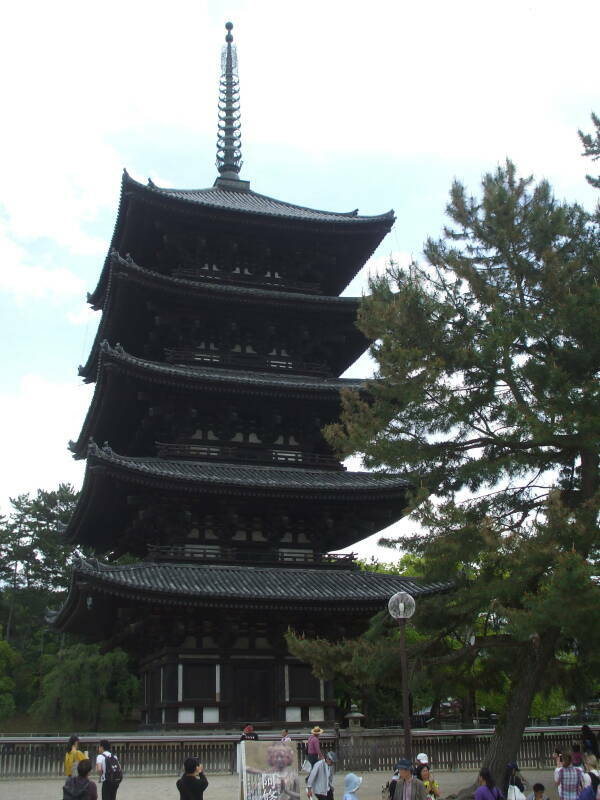 Below is Gojū-no-tō, the five-level pagoda. 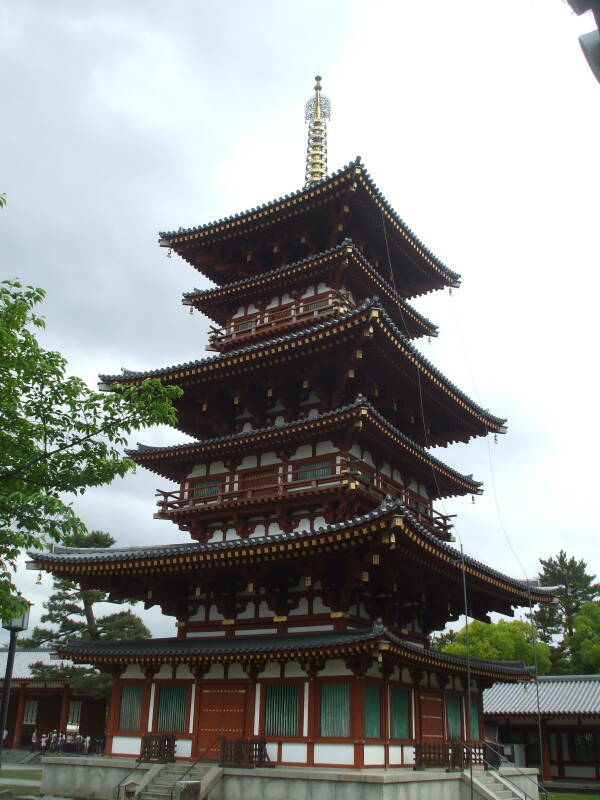 Pagodas are tall wooden structures with metal spires. They are frequently destroyed by fire after lightning strikes. If you own a pagoda, add lightning arresters. At left here is the Nan'endō or South Octagonal Hall. 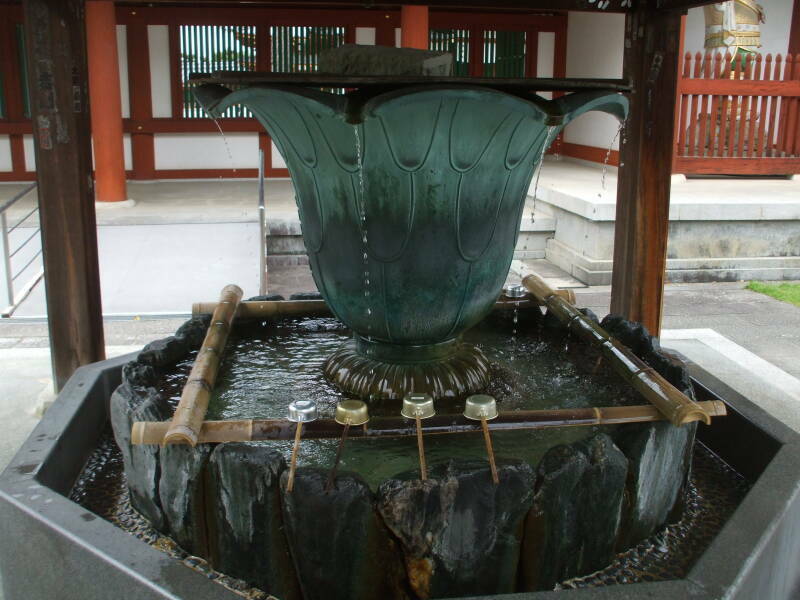 Above is the ablutions fountain at the Nan'endō and Saikondō. 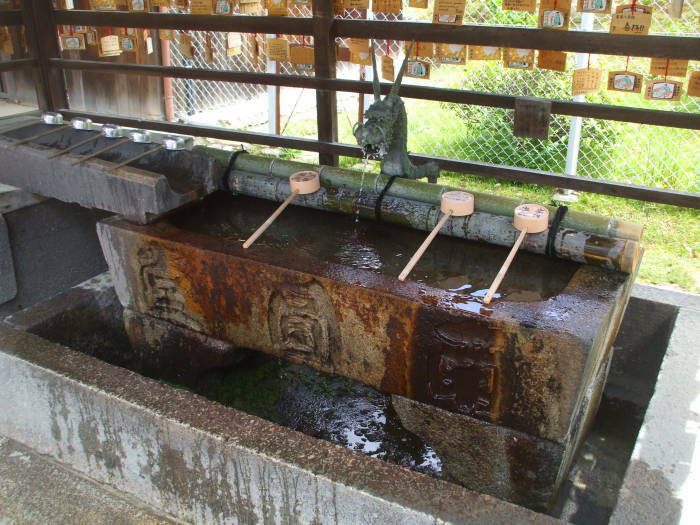 Both Buddhism and Shintō use the same cleansing ritual. 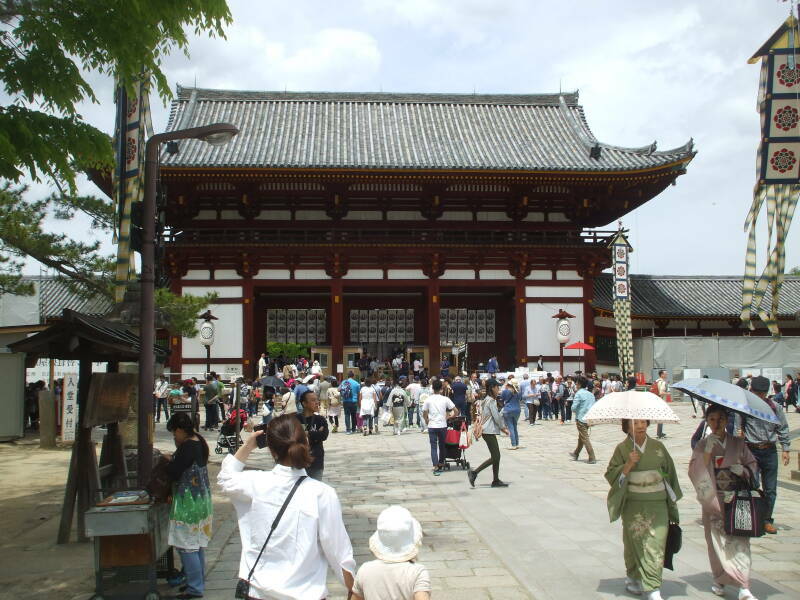 Kōjuku-ji is a Buddhist temple complex, but as usual, it also includes Shintō shrines. The altar below is obviously in a small Buddhist temple. 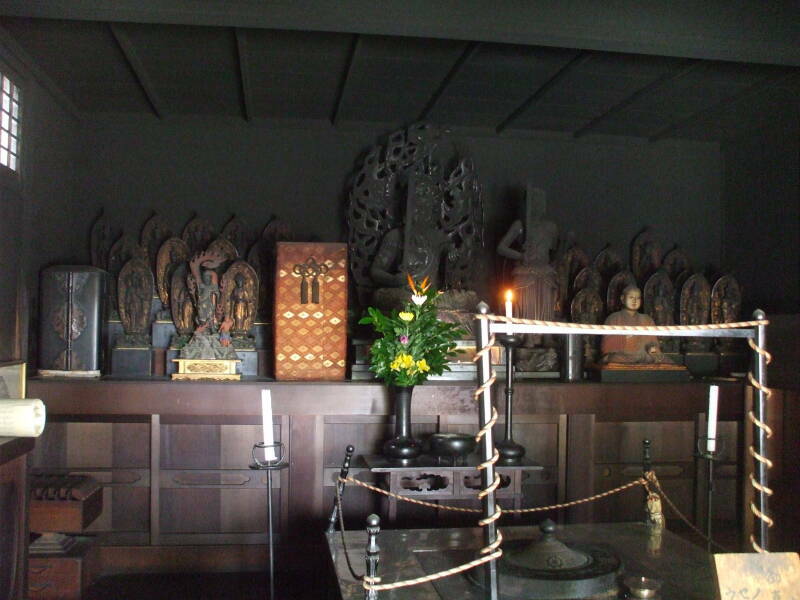 Shintō altars usually have no figure, just a symbol of the enshrined kami or spirit. 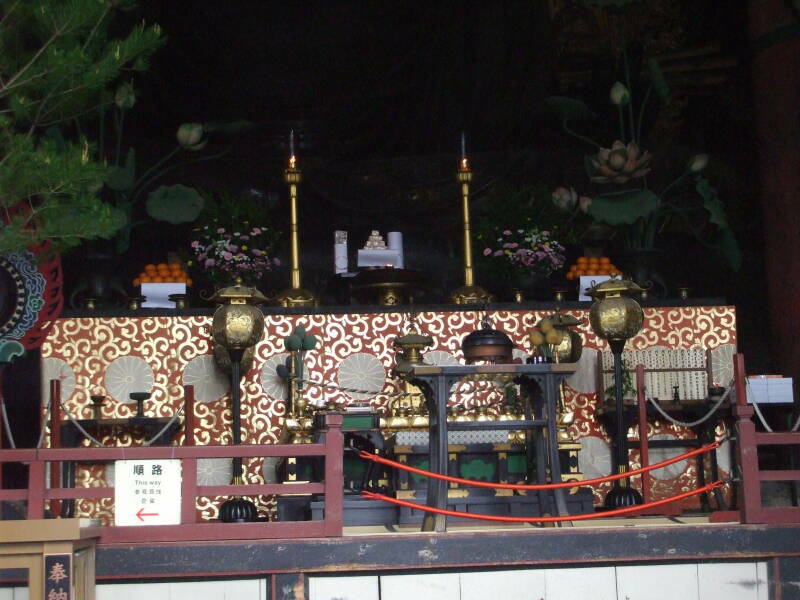 A mirror on the altar, as seen below, is a sign that this is a Shintō facility. 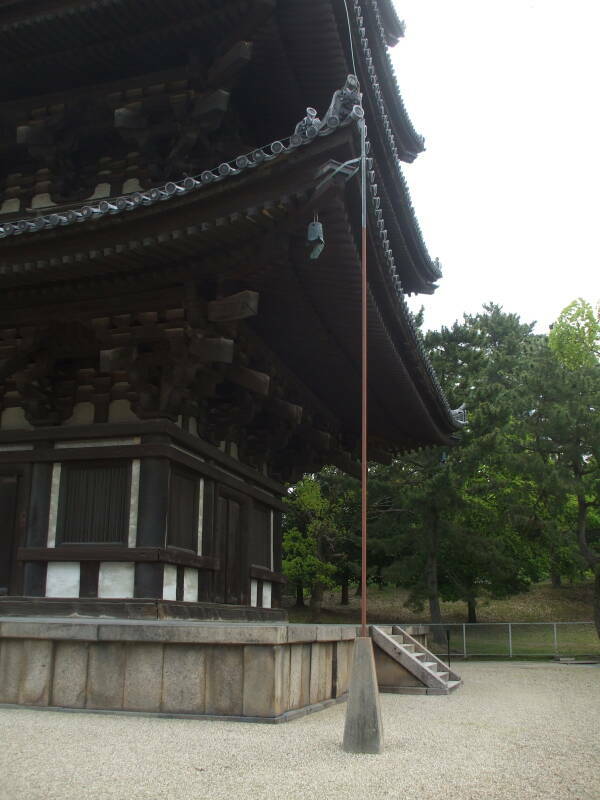 A bell or rattle struck by a rope is another sign of a Shintō shrine. 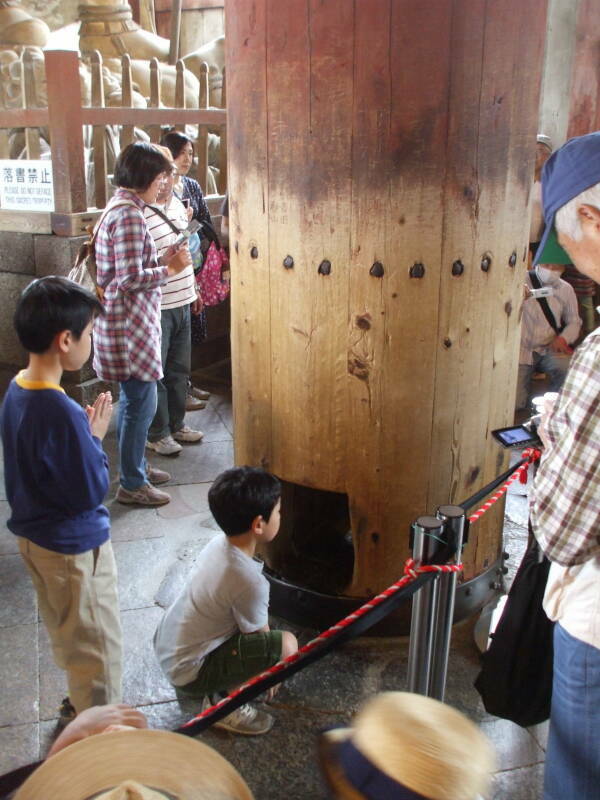 Visitors ring the bell to awaken the kami, the enshrined spirit. 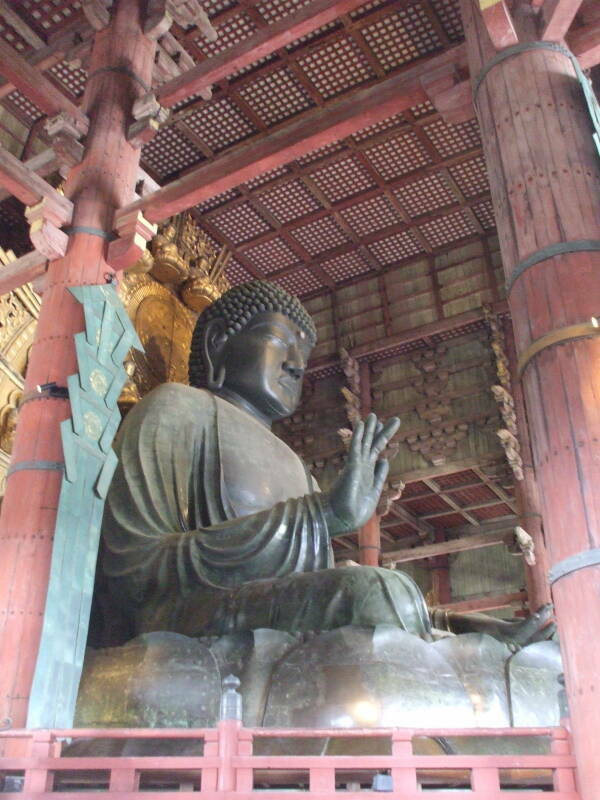 Tōdai-ji was one of the most influential temples in the early centuries of Buddhism in Japan. 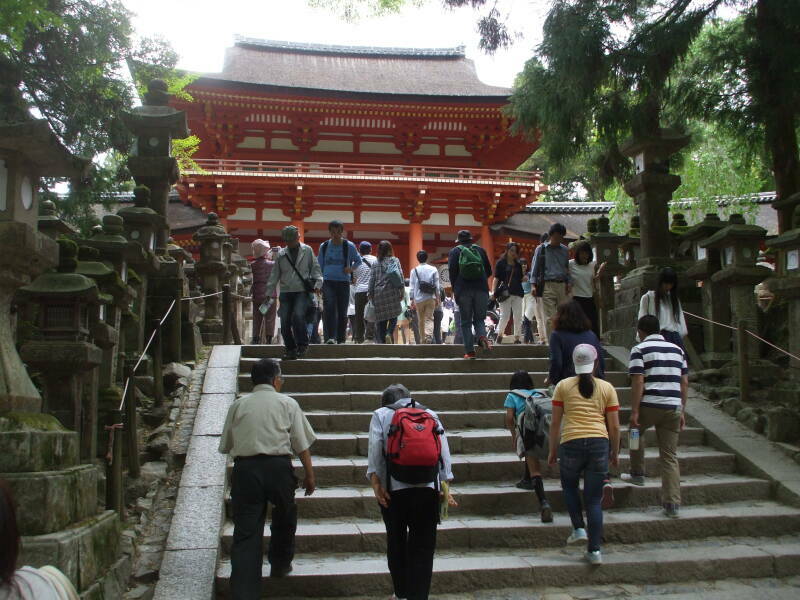 The first temple was built here in 728, within the first two centuries after Buddhism arrived in Japan. The Emperor had moved the capital to Nara in 710. 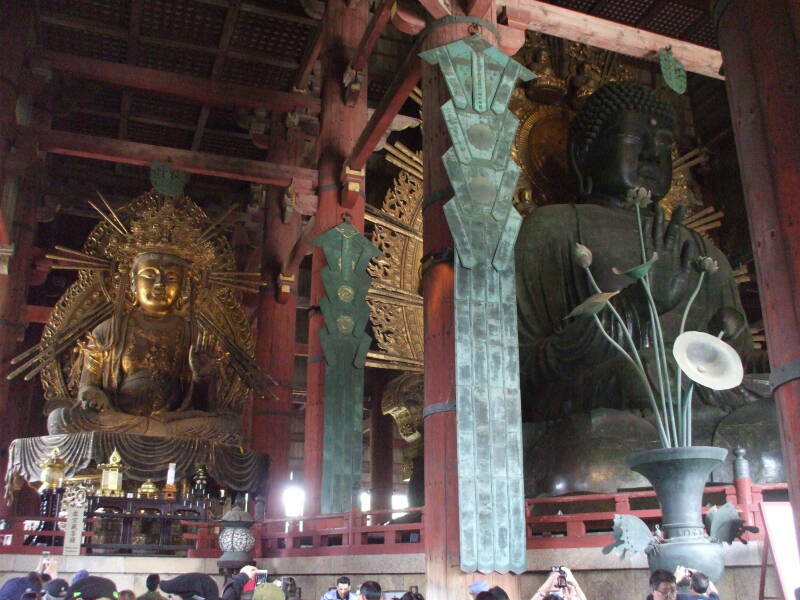 Buddhism was heavily regulated by the national government, and monks had to be ordained at Tōdai-ji. 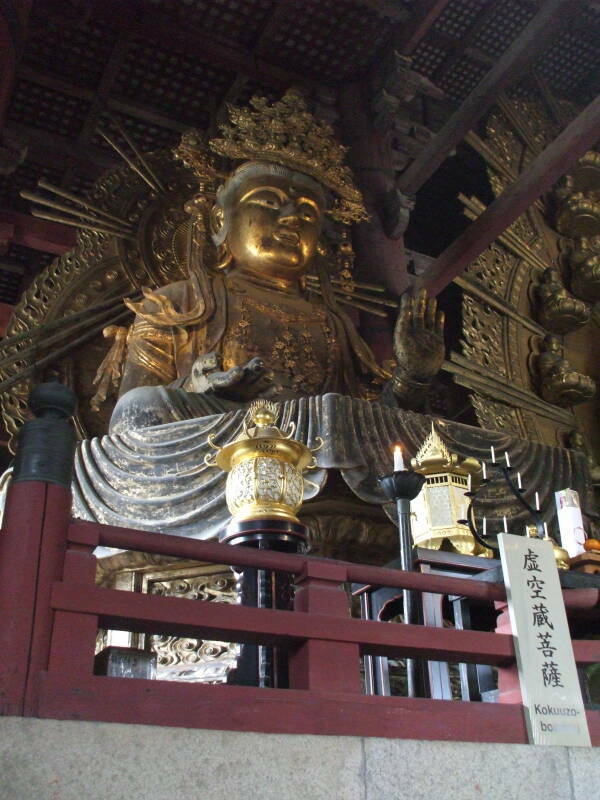 This included Kūkai, who founded the monastery complex at Kōya-san. Below is the inner gate leading to the temple. 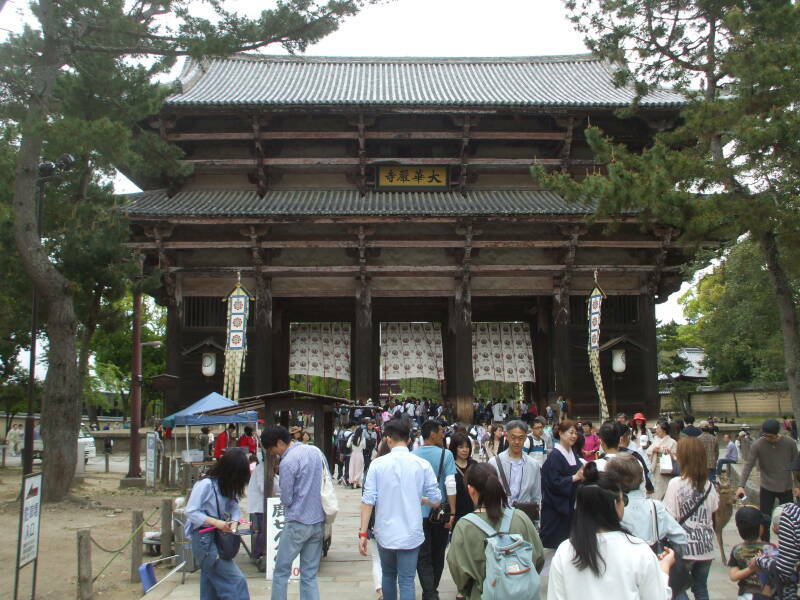 A major temple will have an outer gate and an inner gate, the sanmon. 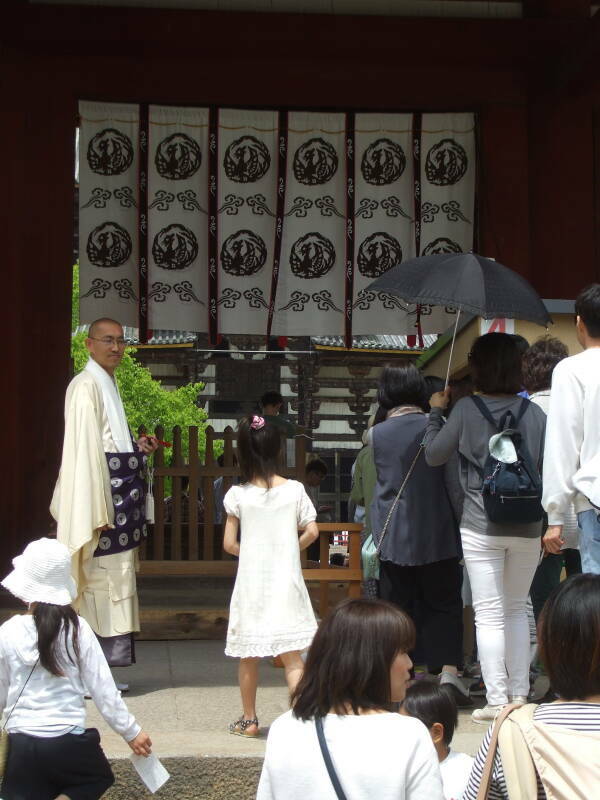 A Buddhist monk welcomes visitors at the inner gate. In we go, toward the enormous temple. 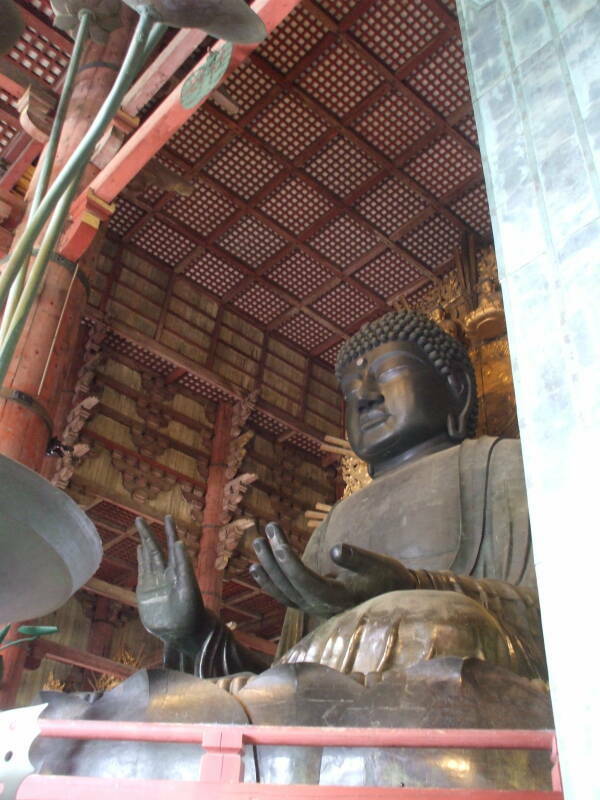 Emperor Shōmu issued a decree in 743 stating that the people of Japan should become directly involved in building new Buddhist temples throughout the country. Things had been chaotic in Japan for a few decades, with unrest, poor harvests, and epidemics including a smallpox outbreak. He believed that pious construction would protect the country from further disasters. 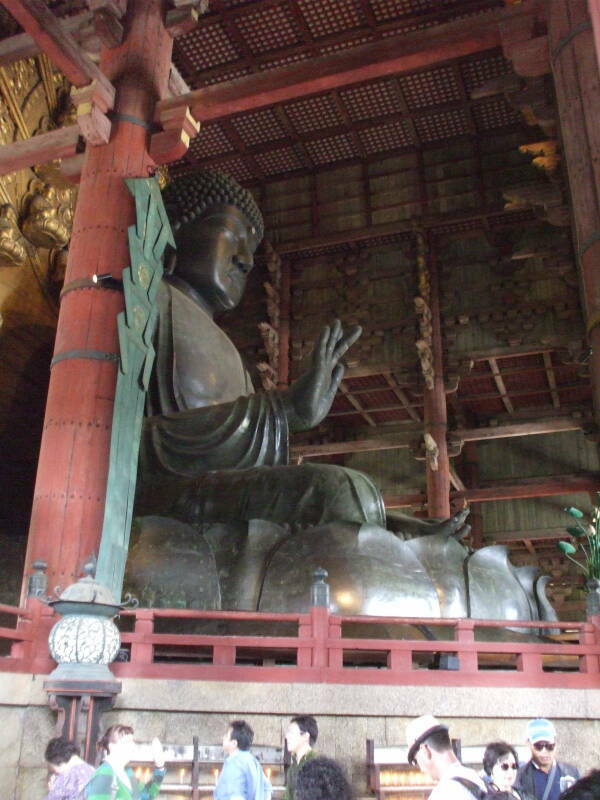 Records say that over 2.6 million people worked on the Tōdai-ji and its Great Buddha. The population of Heijō-kyō, as the city was known then, was 50,000 to 200,000, about half the size of Constantinople at the time. The result was enormous. 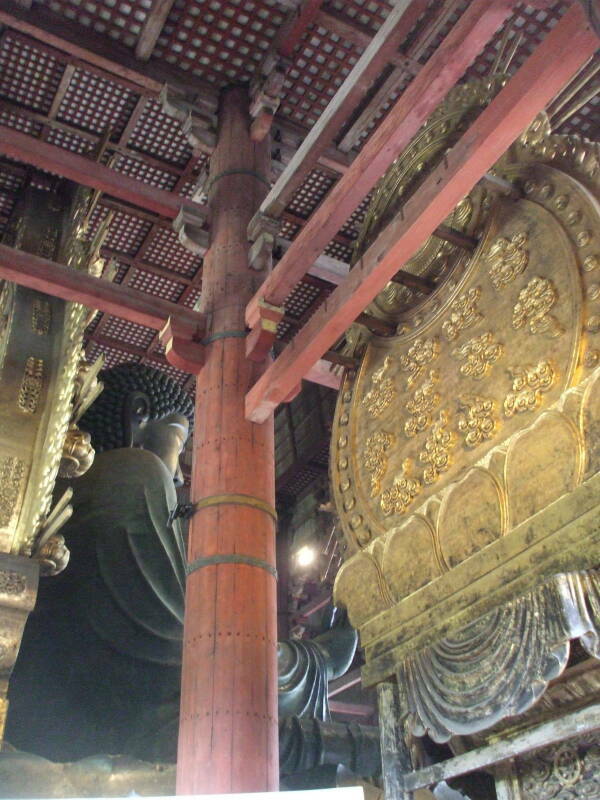 The Daibutsuden or Great Buddha Hall has burned and been rebuilt twice. The current Daibutsuden, finished in 1709, is 57 meters long and 50 meters wide. 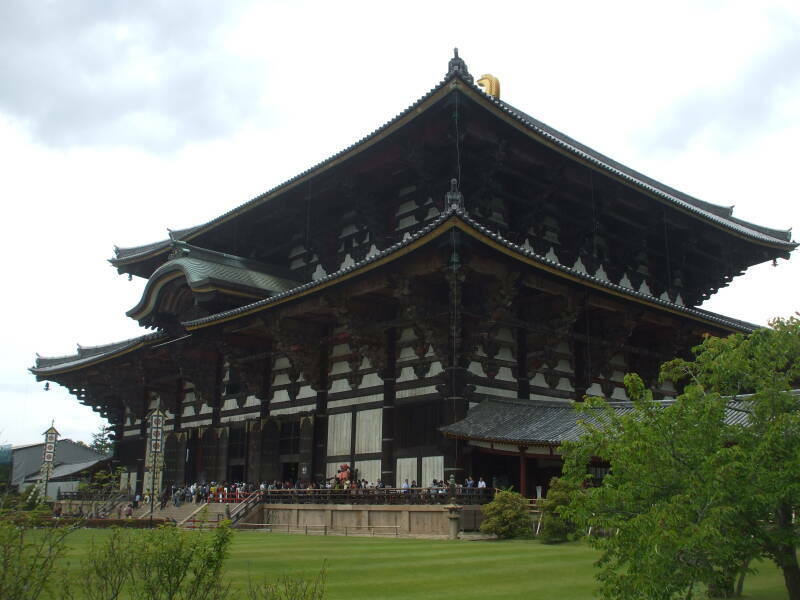 It was the world's largest wooden structure until 1998, and remains the largest wooden building. Still, the original was 30% larger! 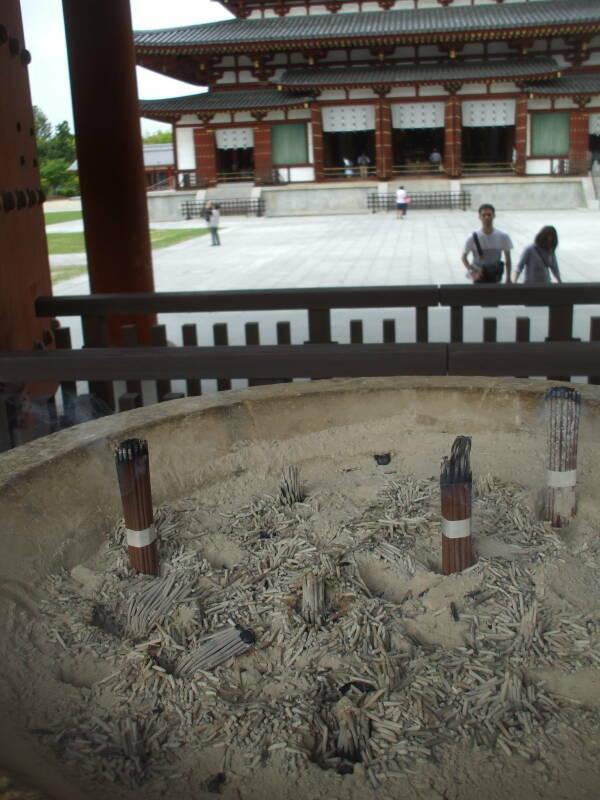 You can wave cleansing incense smoke over your body before proceeding into the temple. "The breath of the gods", they say. 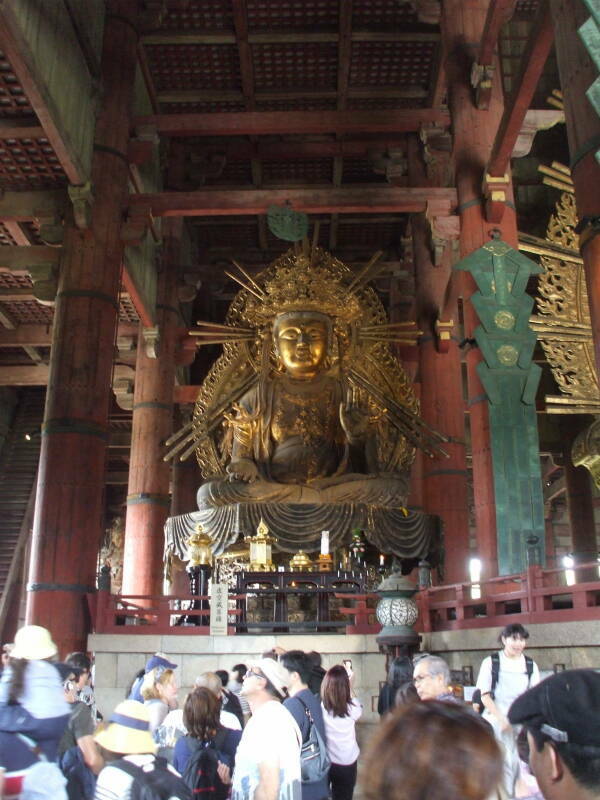 The Daibutsu or Great Buddha is the largest bronze Buddha statue in the world. The Great Buddha is 15 meters tall and weighs 500 tonnes. The halo is 27 meters in diameter. 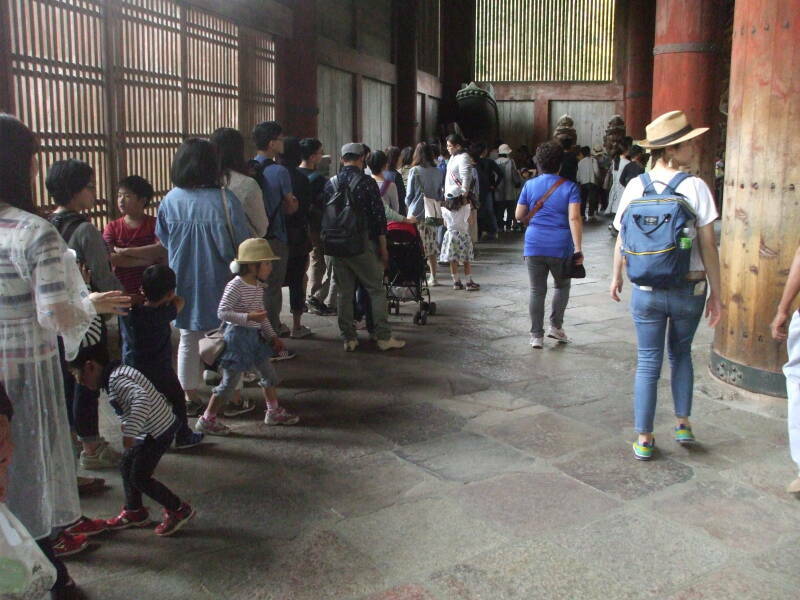 Unusually, photography is fully tolerated within Tōdai-ji. The statue was constructed with 8 bronze castings over 3 years. For each casting they first built a rough framework of wood and other material. They covered that with clay, and sculpted smaller scale features into the clay. Once that clay had dried, it was used as a form for an outer layer of mixed clay and sand. They baked the outer layer and removed it in sections to form the outer mold. Then they cut down the original inner clay form to serve as the inner form surface. Finally, they reassembled the inner and outer forms and poured and melted bronze into the resulting space. The project almost bankrupted the national economy, as it used most of the available bronze. The statue was gilded, and all the gold had to be imported. Gilding at that scale was especially hazardous. They formed an amalgam by dissolving gold in mercury at a ratio of about 1:5 to 1:6 by weight. They applied the resulting fluid to the statue, then treated the surface with flame to evaporate the mercury. The process left a uniform layer of gold on the statue's outer surface, but it created an enormous amount of mercury vapor. People have long suspected that the mercury contamination around Heijō-kyō caused many cases of an unidentified disease that was interpreted as divine punishment, eventually causing the government to relocate the capital. 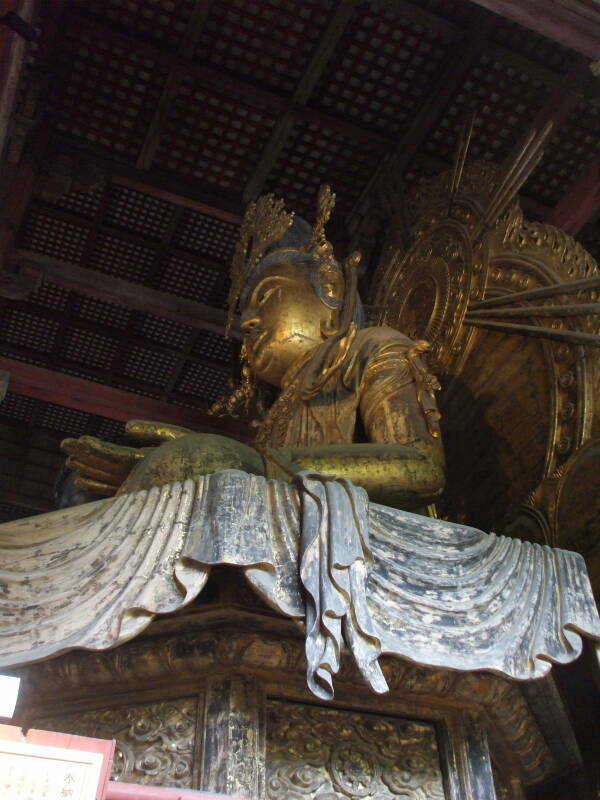 The paper "Heavy metal pollution in Ancient Nara, Japan, during the eighth century" explains that the gilding process used an estimated 146 kilograms of gold and 820 kilograms of mercury. * But despite all the mercury, other heavy metals were worse. * Hodaka Kawahata, Shusuke Yamashita, Kyoko Yamaoka, Takashi Okai, Gen Shimoda and Noboru Imai; Progress in Earth and Planetary Science; 2014 1:15. The authors of the 2014 paper conclude that the mercury contamination was limited to the area immediately around the temple. However, the chemical hazard wasn't limited to mercury. Copper contamination of soil and water is also dangerous. The bronze of the statue was made from almost 500,000 kg of copper and 8,500 kg of tin. Lead levels were surprisingly high in the soil across the ancient city. Mercury and lead were used to produce pigments, enamel, and glass. 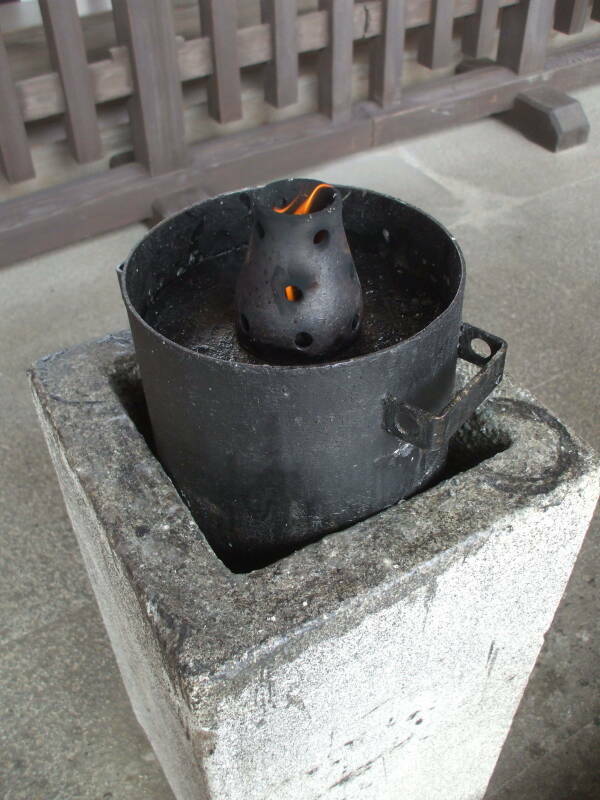 Lead was also used by blacksmiths for soldering. There have been theories for several years of dangerous levels of mercury in the ancient city. 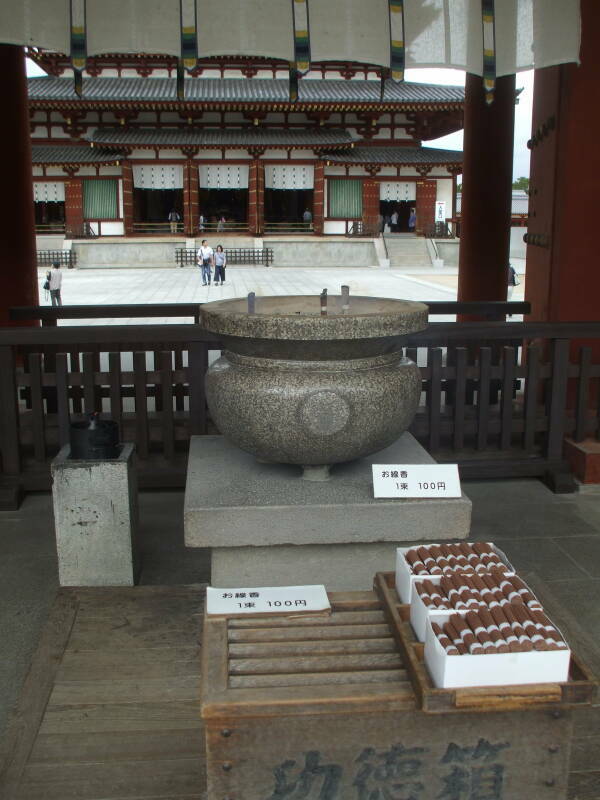 However, the mercury and copper contamination was limited to the temple area. Lead poisoning was the big problem. 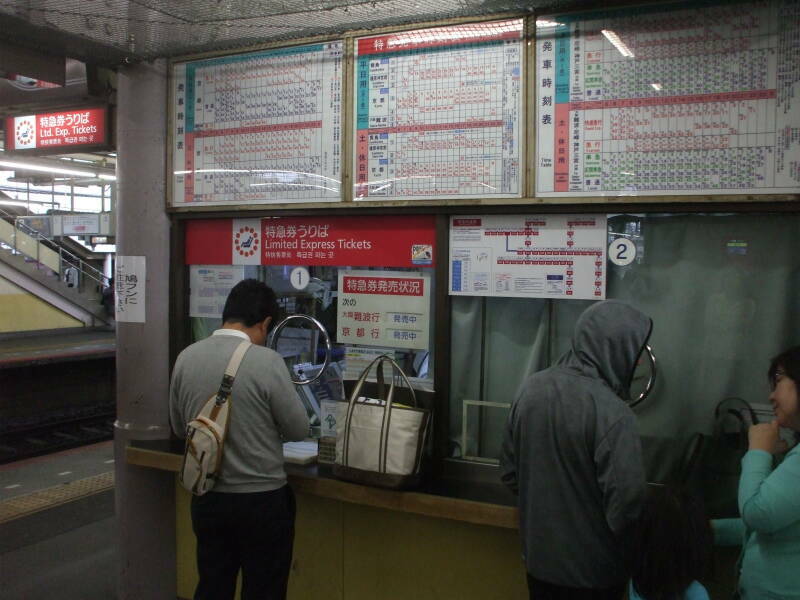 Several sites had lead levels above current Japanese national safety standards. The statue was finished in 751 and dedicated the following year. 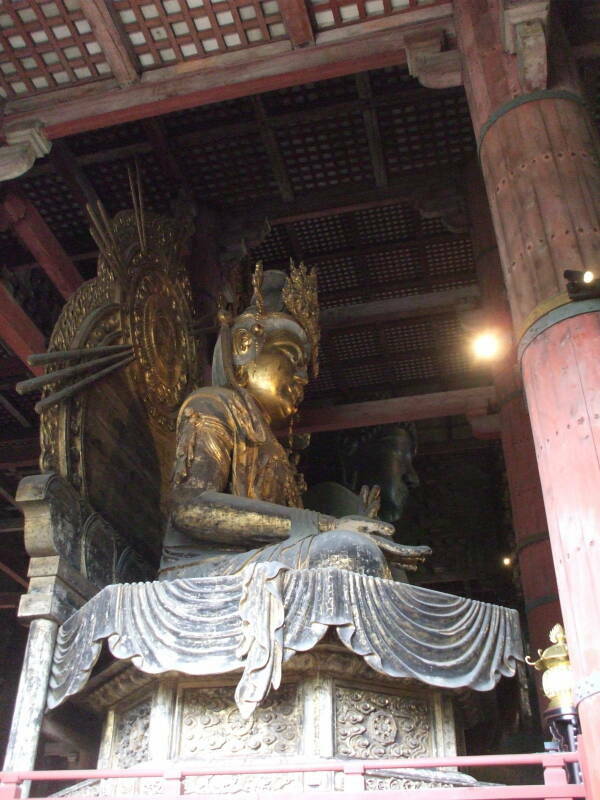 The statue represents Vairocana, a celestial Buddha. It is flanked by Bodhisattvas, enlightened beings. 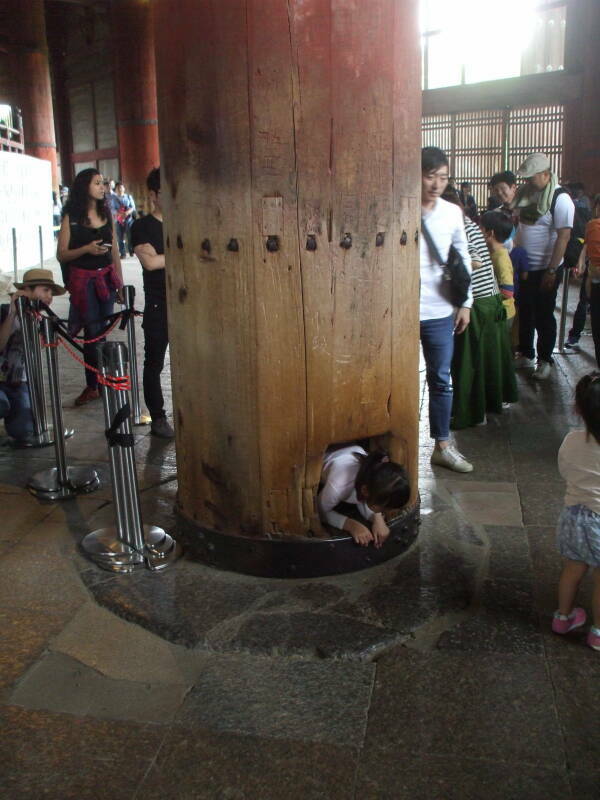 People wait in line for their children to crawl through a hole in the base of a pillar. The hole is the size of one of the Buddha's nostrils. 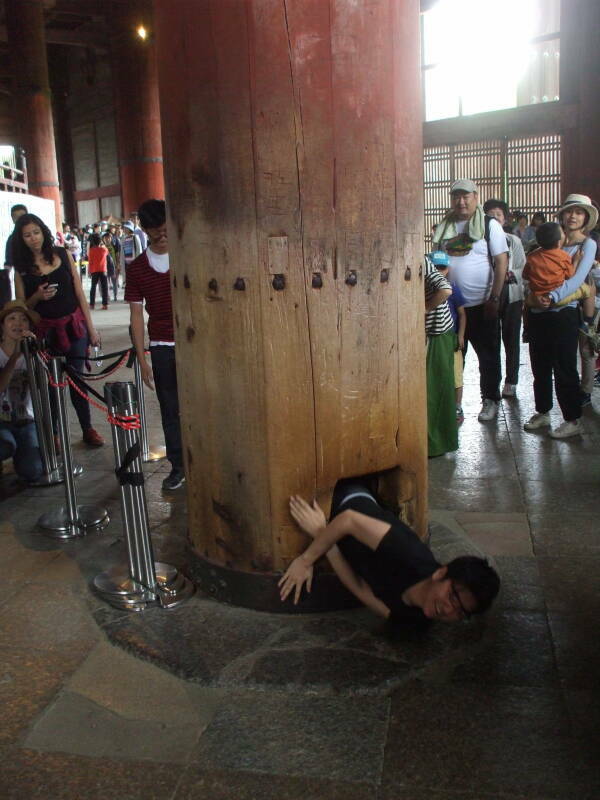 It is most auspicious if you can squeeze through the hole. 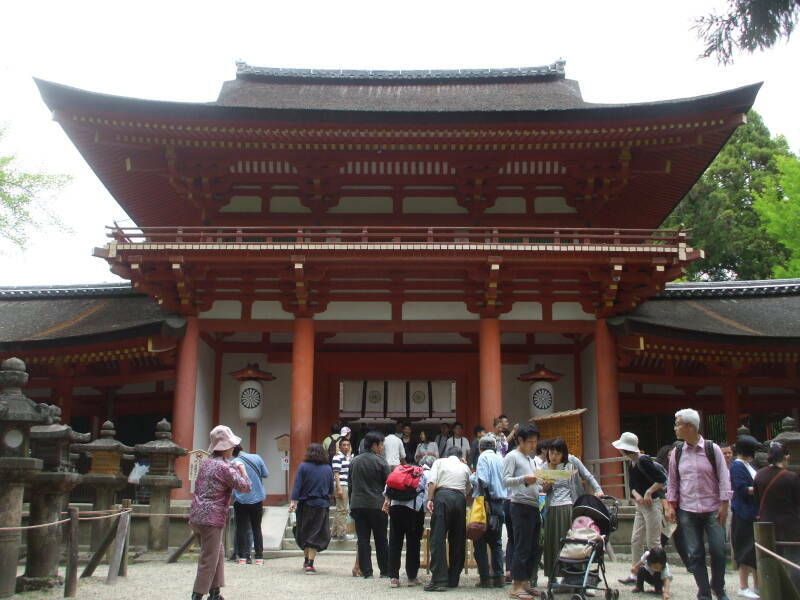 Kasuga-taisha is the Shintō shrine of the Fujiwara family. 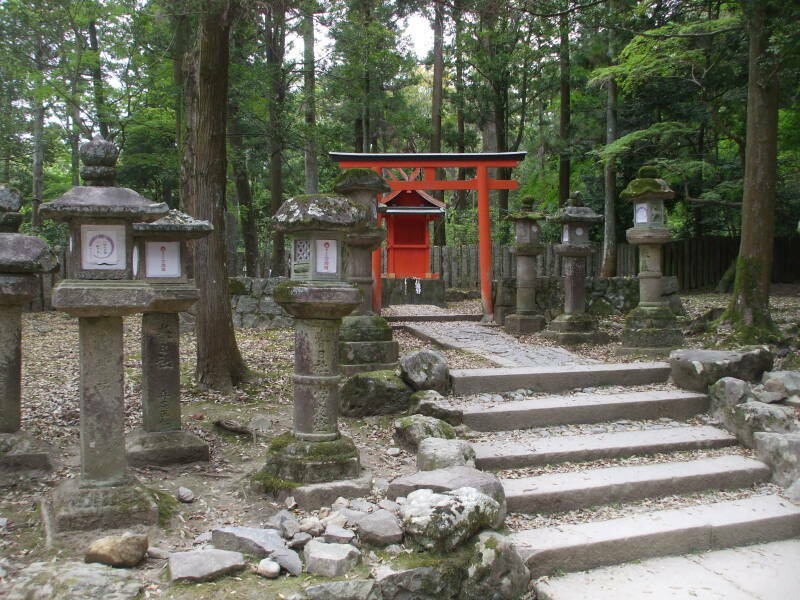 The approach through the forest is lined by hundreds of stone lanterns, and the shrine has many bronze lanterns. It and the surrounding forest are part of the UNESCO World Heritage Site designation. Above is the entrance to the honden or main sanctuary. 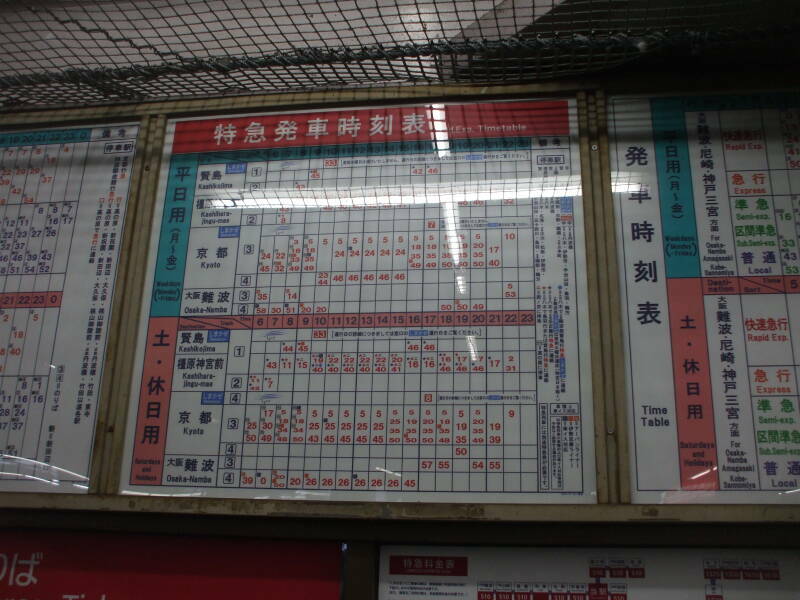 A sign at the shrine lists the deities. Takemikazuchi-no-mikoto is the one who arrived riding on a white deer, leading to today's sacred deer. 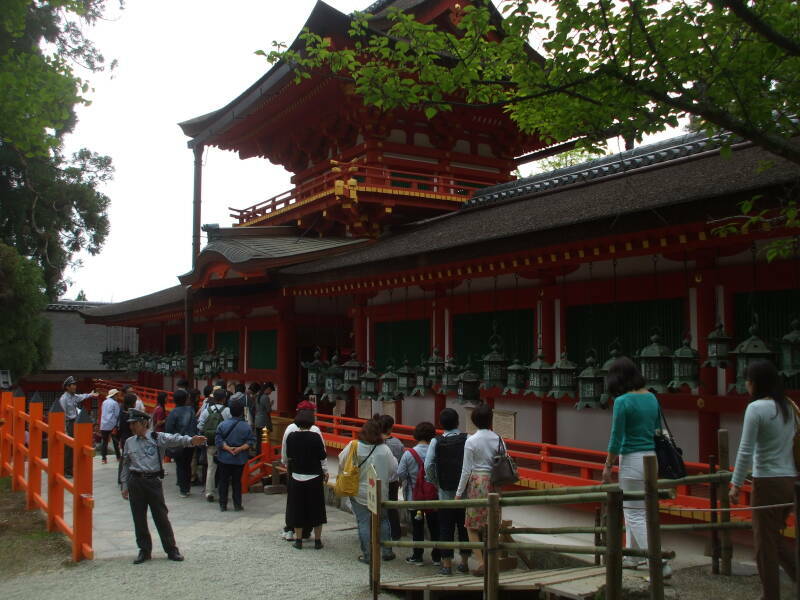 The origin of Kasuga Taisha dates back to the year 768, when these four deities were invited to reside here on the side of Mount Miksa out of a desire for the prosperity of the nation as well as the happiness of its citizens. 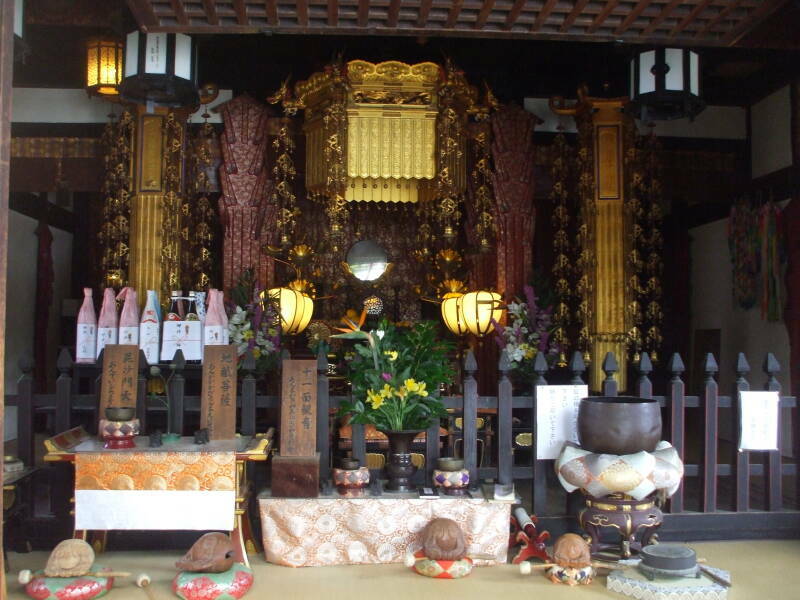 These four deities, known as Kasuga-sume-ookami or Kasuga-Daimyojin (the Great Deities of Kasuga), are enshrined respectively in their own splendid Kasuga-style altars. 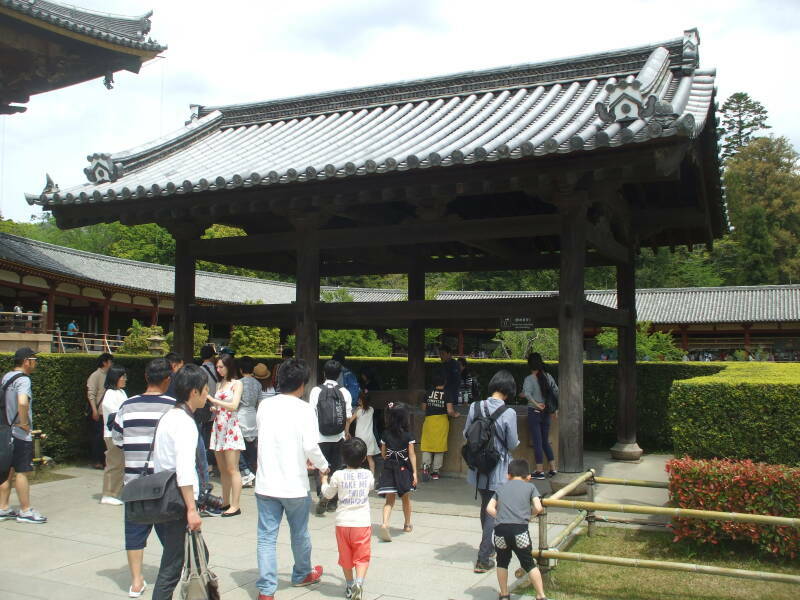 This shrine continues to attract people's respect and worship. Even today, as in the past, more than 2200 time-honored rituals are conducted annually, including daily morning and evening sacred food-donating rites. 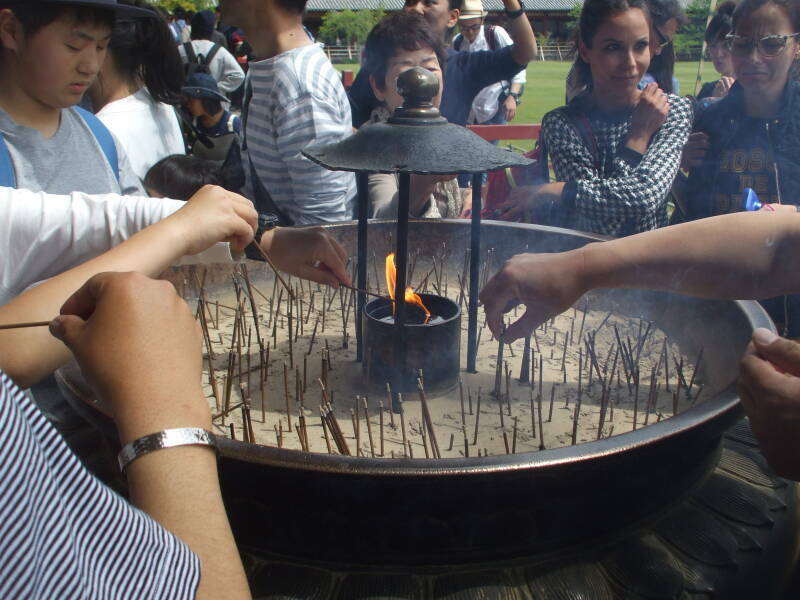 These rituals are held not only for Japan, but also for world peace, happiness, and mutual prosperity. Back in the center of town I saw one of the notorious sound trucks. 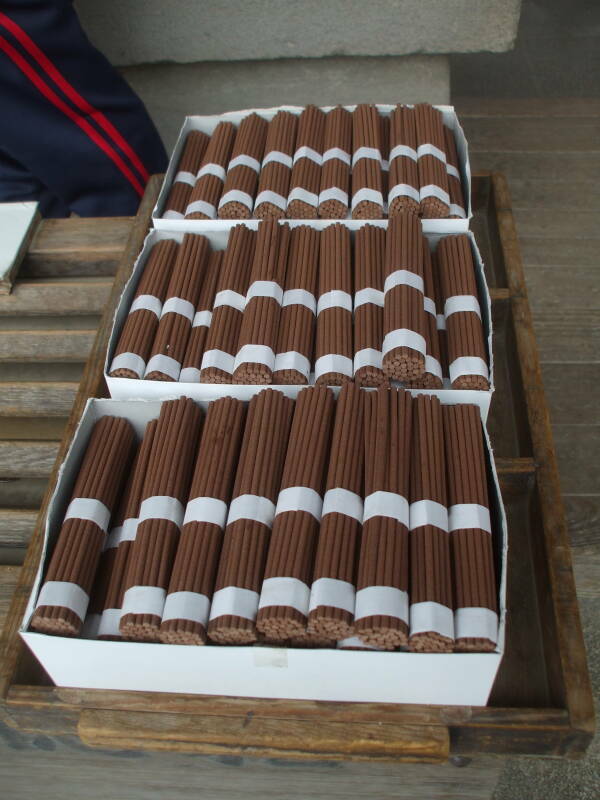 I had read that these tend to be used by fringe and right-wing politicians, politicially affiliated with the yakuza and into militantly nationalist views. But since I couldn't understand what they were saying, they seemed like boring calm politicians. 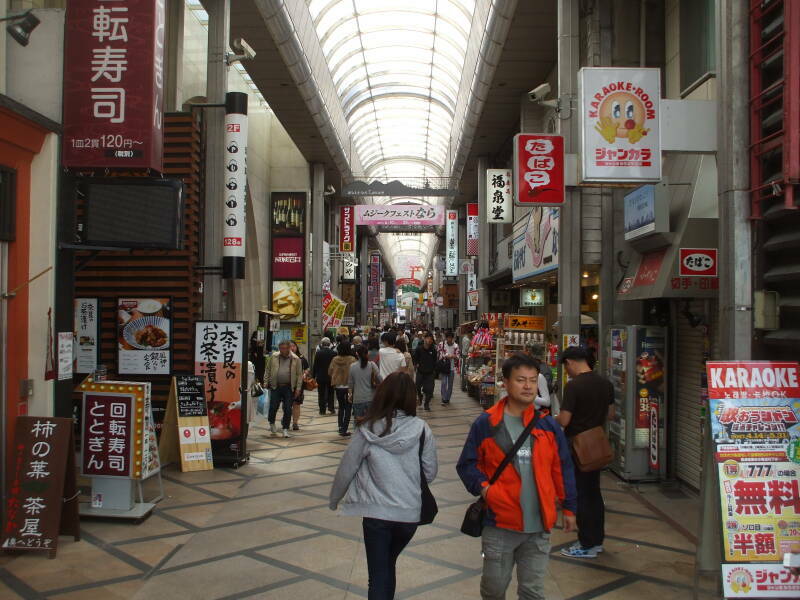 There is a covered shopping arcade running north to south near the Kintetsu train station. 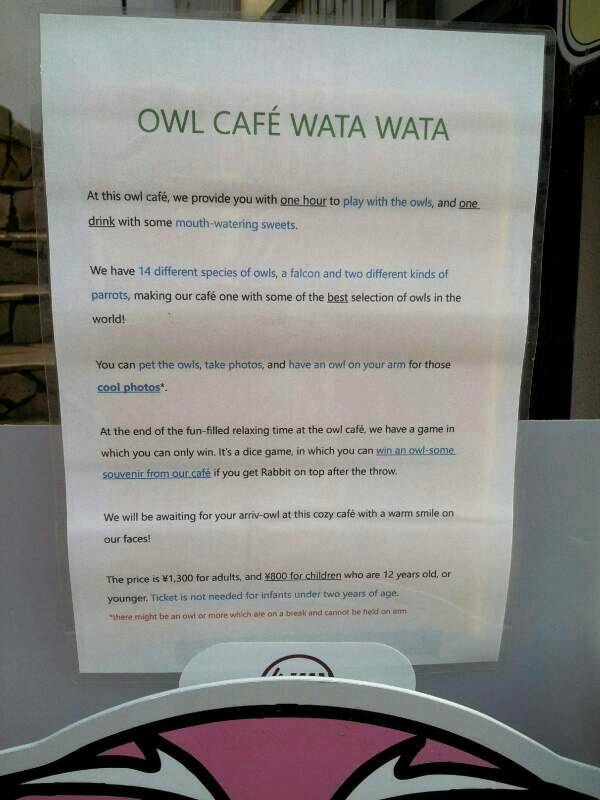 It has one of the famous owl cafes. 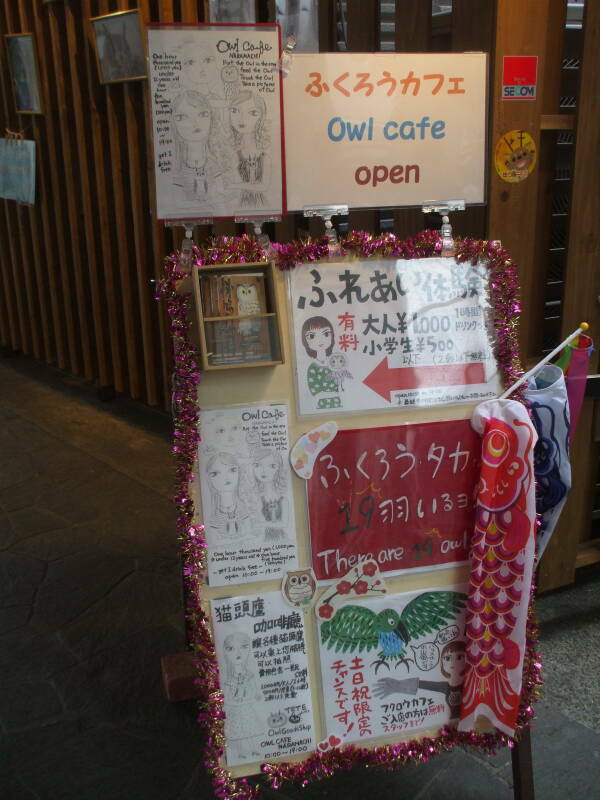 ふくるづ かフエ or fu-ku-ru-du ka-fu-e.
A nearby open street has another owl cafe. 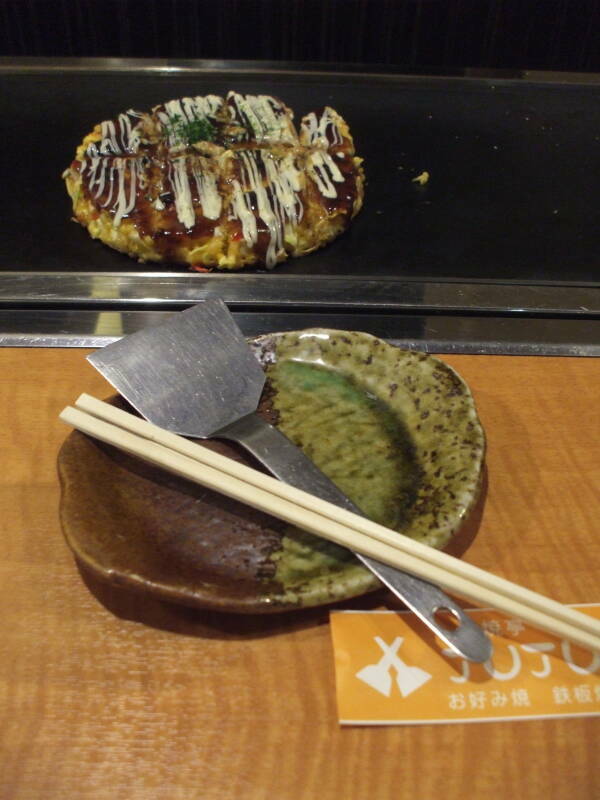 Okonomiyaki is a specialty of the region. It's a savory pancake, with a batter made of flour, grated yam, eggs, and shredded cabbage. 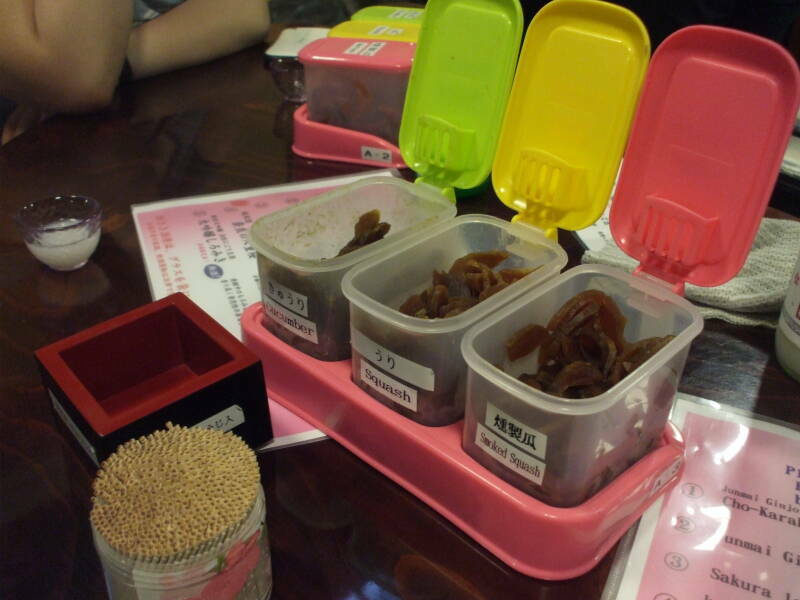 You can select from a variety of fillings: various types of seafood, pork belly, vegetables, and more. I wanted to use a computer to transfer pictures from my phone and camera to a USB stick. I stored my pack at the Hiloki Hostel the morning of my last day in town and went to a Comic Buster Internet / manga / anime cafe. It was my first time ever at that chain, so I showed my passport and got a membership card. Then I could pay by the hour to use the computers. All I wanted to do was transfer data between USB devices. 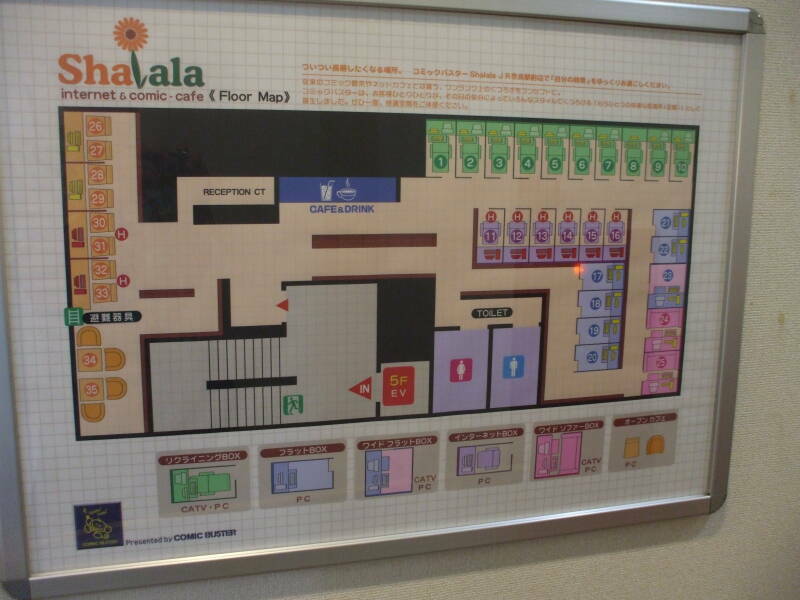 Most people go to this type of cafe to access the Internet, and to watch anime from what strikes me as a vast library. Snacks are cheap and drinks are free. 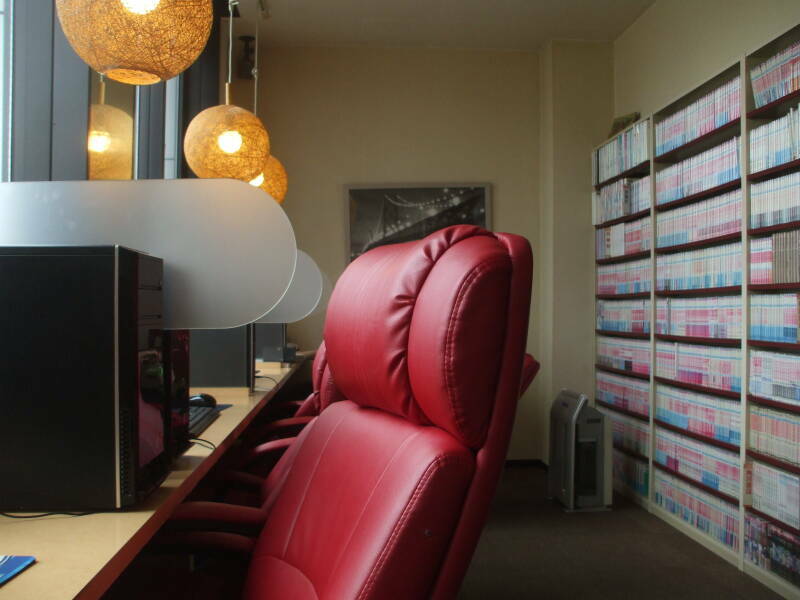 For a little more you can rent a cubicle with a reclining chair. Some young people, the "cyber-homeless", have no home and sleep in recliners at Internet cafes every night. I have not done that. Not yet. 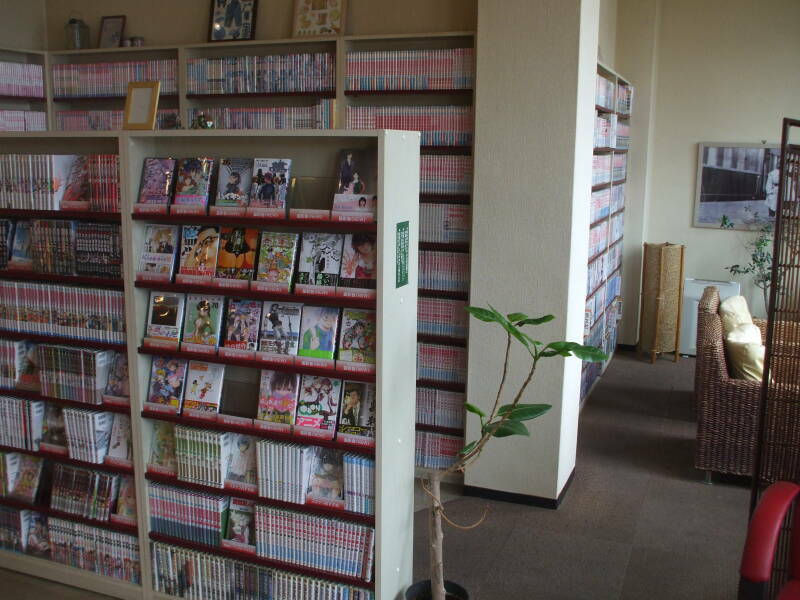 There are many shelves with manga and a wide variety of magazines. 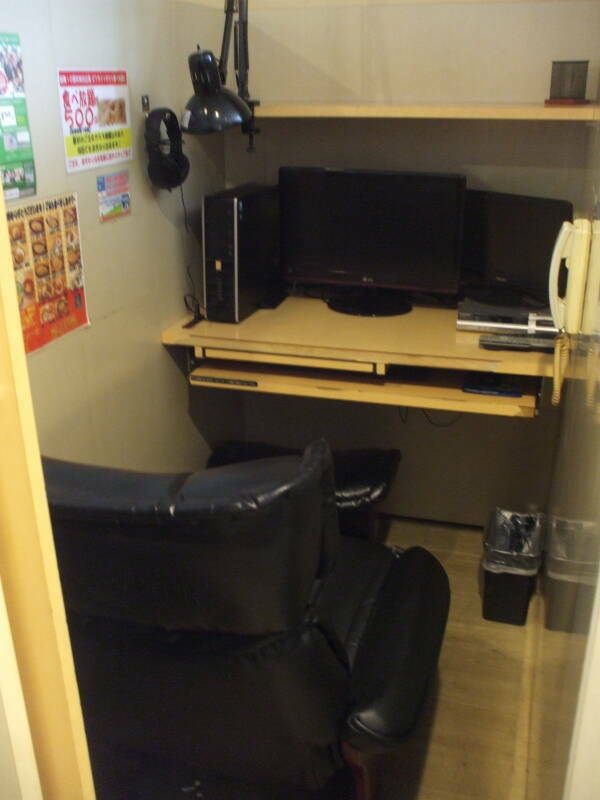 There are both 1-person and 2-person cubicles at this Internet cafe, which I understand is fairly typical. I got my breakfast every day in Nara at 7-Eleven or another convenience store, the same as in several other cities I visited in Japan. 7-Eleven is an international chain. 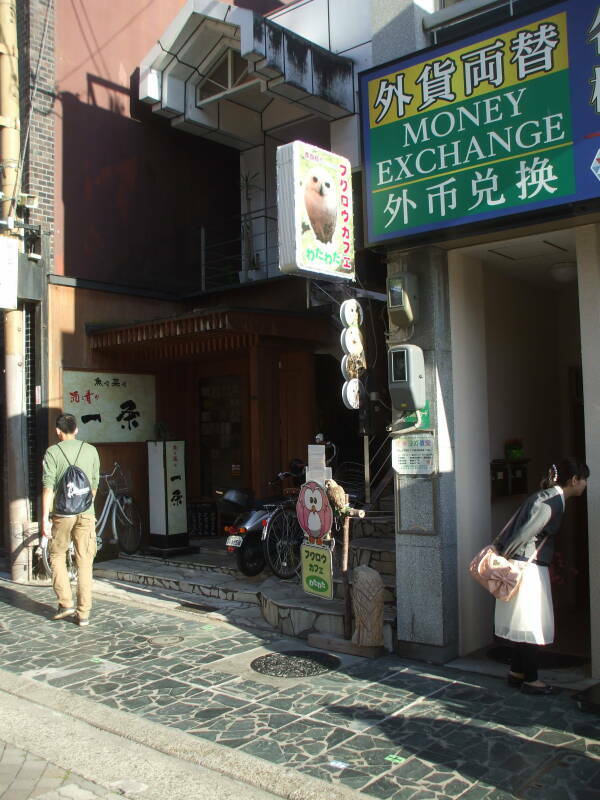 Its parent company is Seven-Eleven Japan Co., Ltd., based in Chiyoda-ku, in central Tōkyō. Yes, it's really Sebun-Irebun or セブン-イレブン. 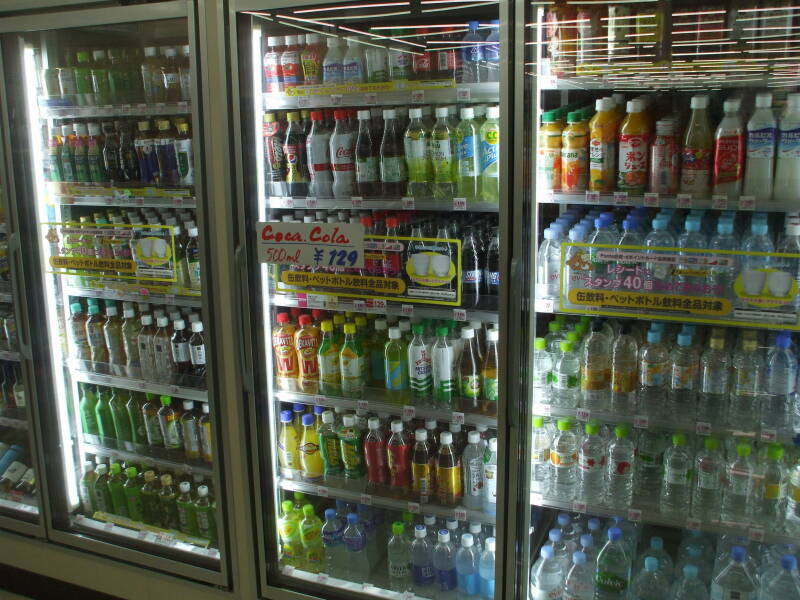 There were almost 19,000 7-Eleven stores in Japan as of the mid 2010s, more than in any other country. In the 1990s it may have been hard to find automated bank machines that accepted foreign cards. Now go into any 7-11, as Seven Bank is also a subsidiary of the parent company. 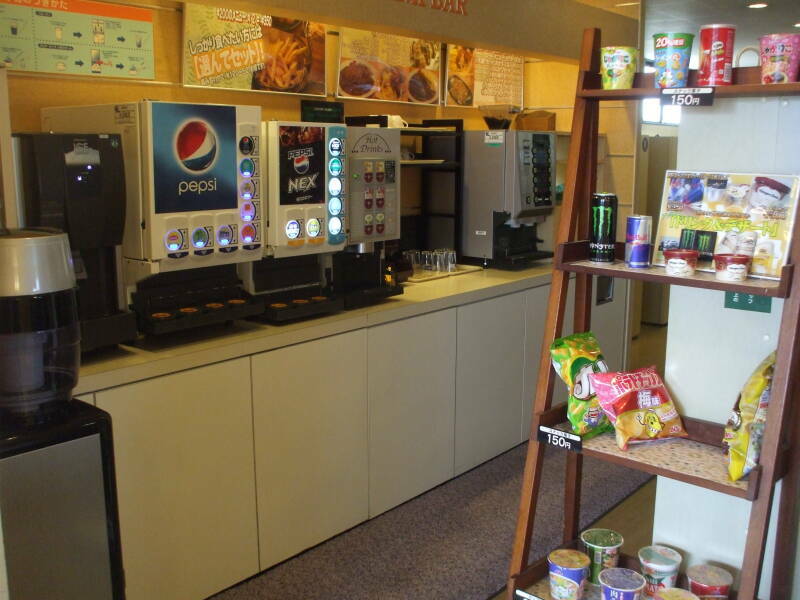 They and competing chains Family Mart and Lawson Station have tasty breakfast, snacks, and lunch. Lawson started in Ohio, in the US. In the mid 1980s they changed the name of the stores to Dairy Mart. They were bought by Alimentation Couche-Tard of Quebec in 2002, and the Lawson's stores in the US changed to Circle K. Meanwhile, a branch of Lawson, since bought by Mitsubishi, had opened in Japan in the 1970s. Now there are over 11,000 Lawson stores in Japan. "Lawson" is a terribly non-Japanese word, it's written in Roman characters on the sign but the company is ローソン or Rōson. 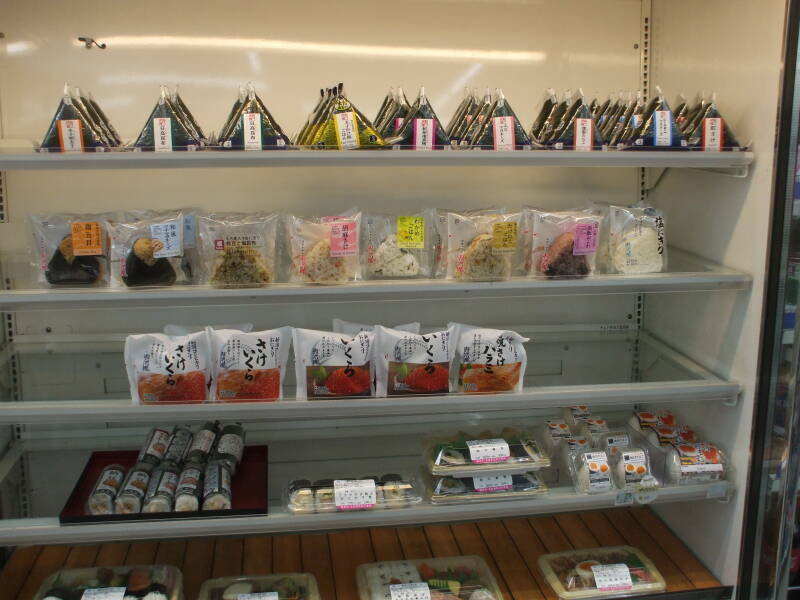 See my page from Kamakura for details on how to unwrap and eat o-nigiri. 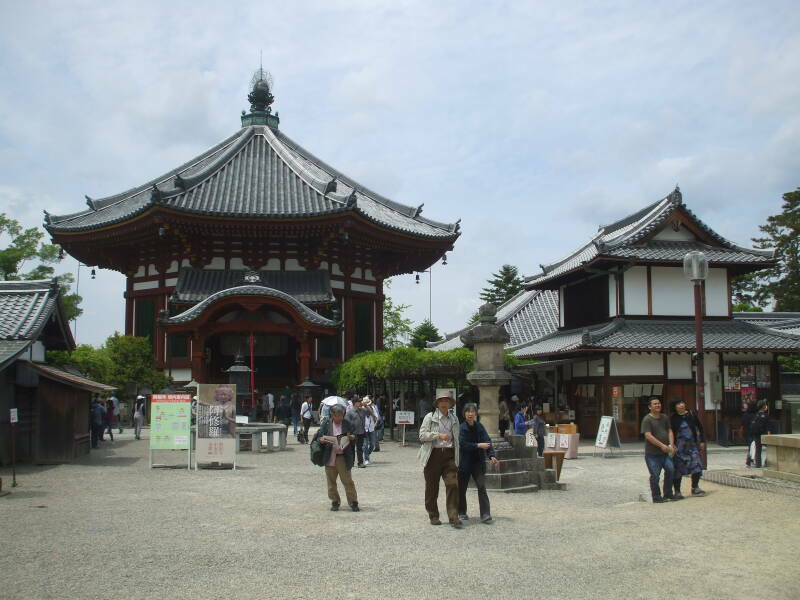 Yakushi-ji temple is a short distance outside Nara, easily reached via the Kintetsu railroad. 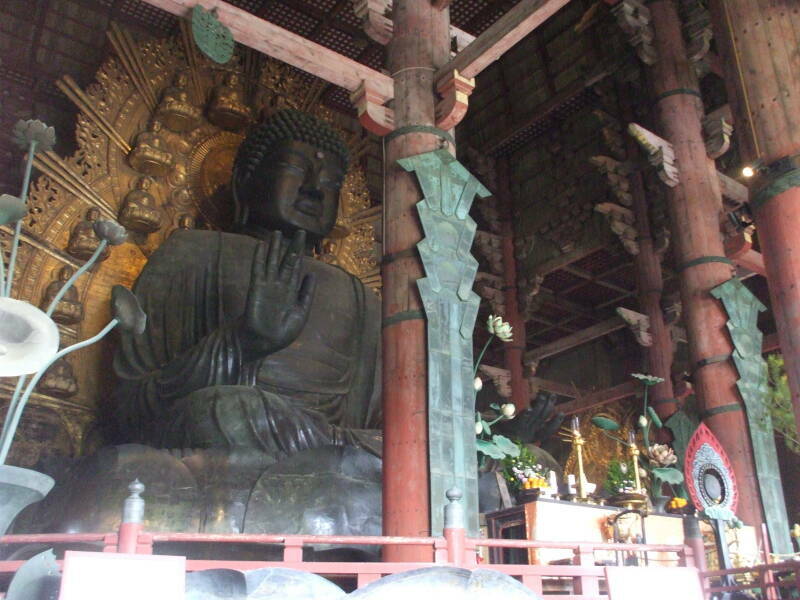 Emperor Tenmu built the original Yakushi-ji in 680. His consort was sick, and he hoped that building a temple devoted to Buddhist figures would cure her illness. She recovered. But then he died before the temple complex was completed and she followed him as ruler of Japan under the reignal name Empress Jitō. 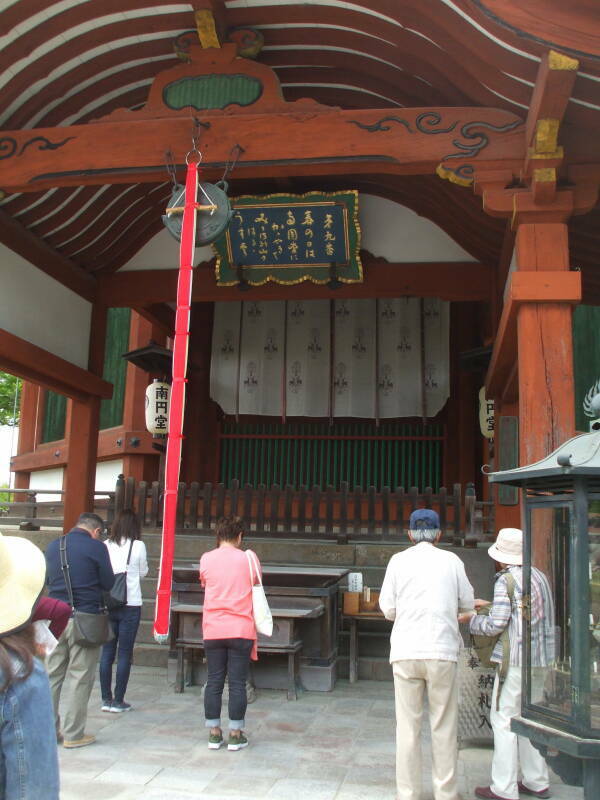 She finished building the original Yakushi-ji. 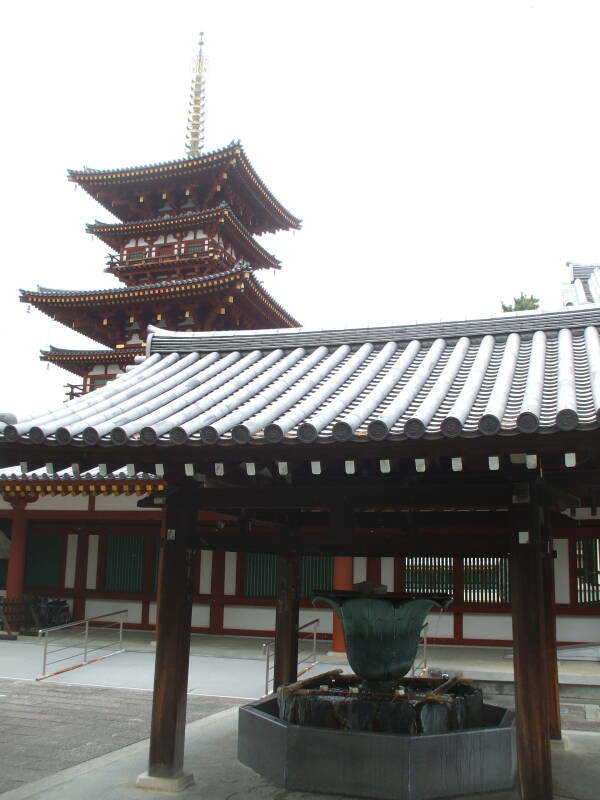 The original temple complex was built in Fujiwara-kyō, the capital at the time. The capital moved to Heijō-kyō, today's Nara, in 710. 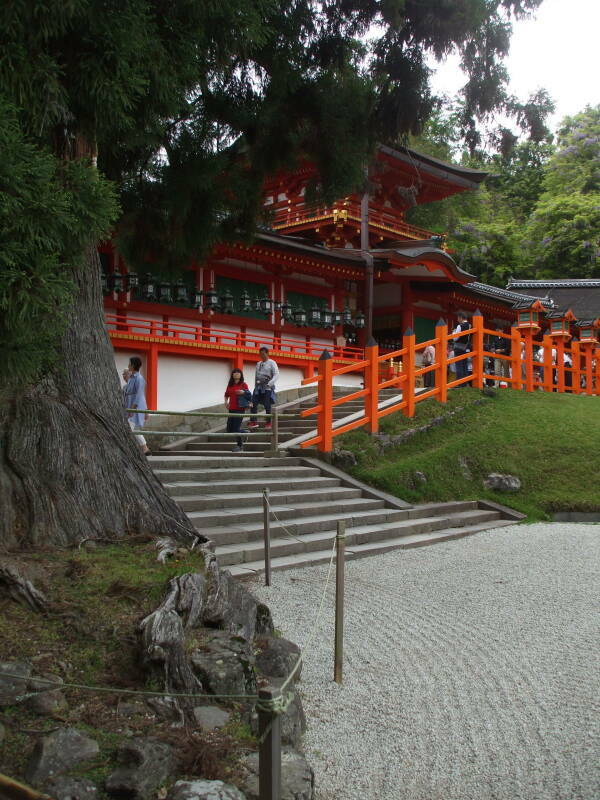 A new Yakushi-ji temple complex was built here in the early 700s. 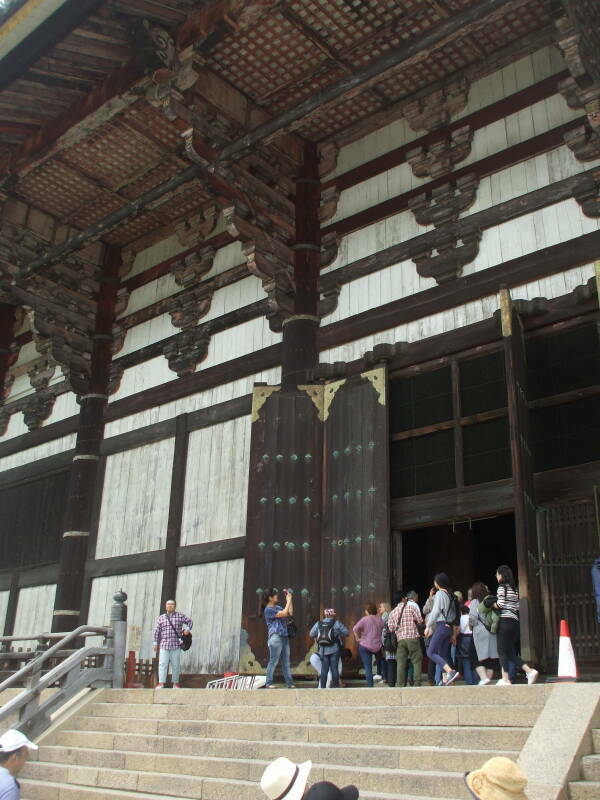 As usual at Japanese temples, fires and civil wars through the centuries led to periodic rebuilding. 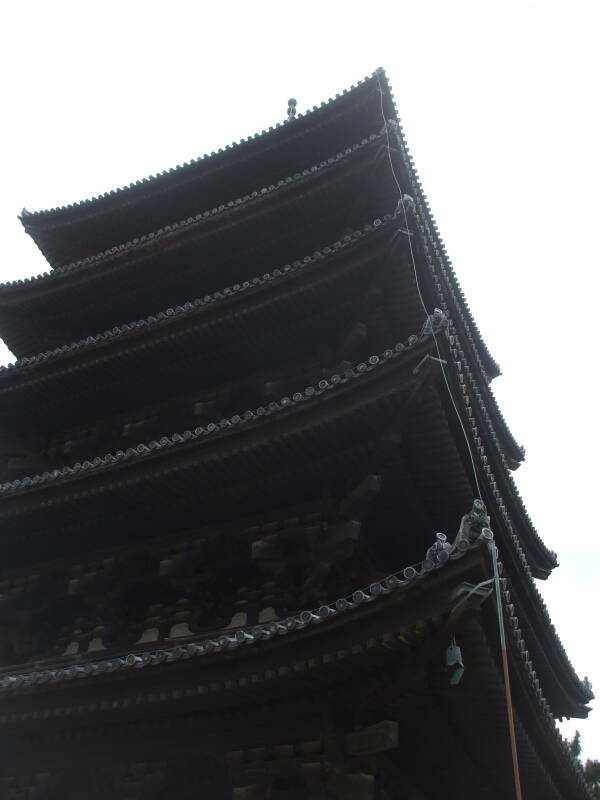 The three-level East Pagoda was finished in 730. 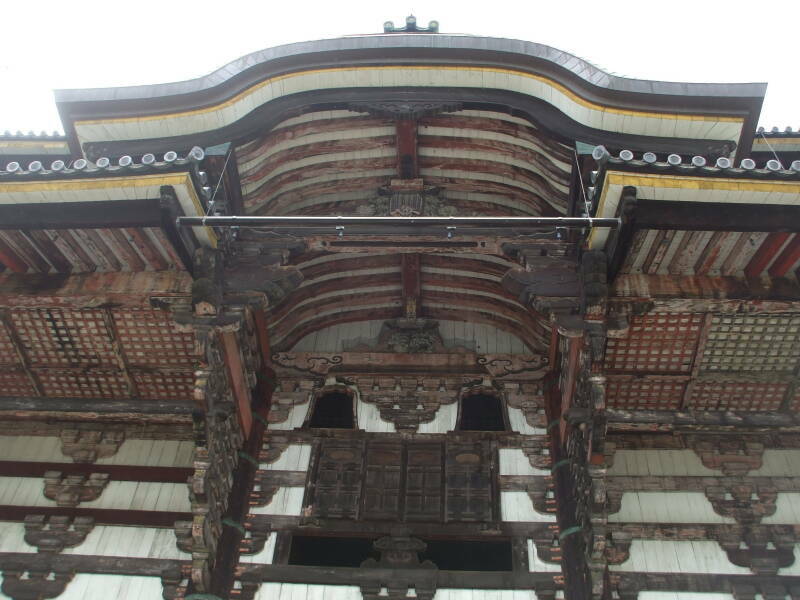 It is the only original structure at Yakushi-ji, and it has been through several rounds of extensive restoration. 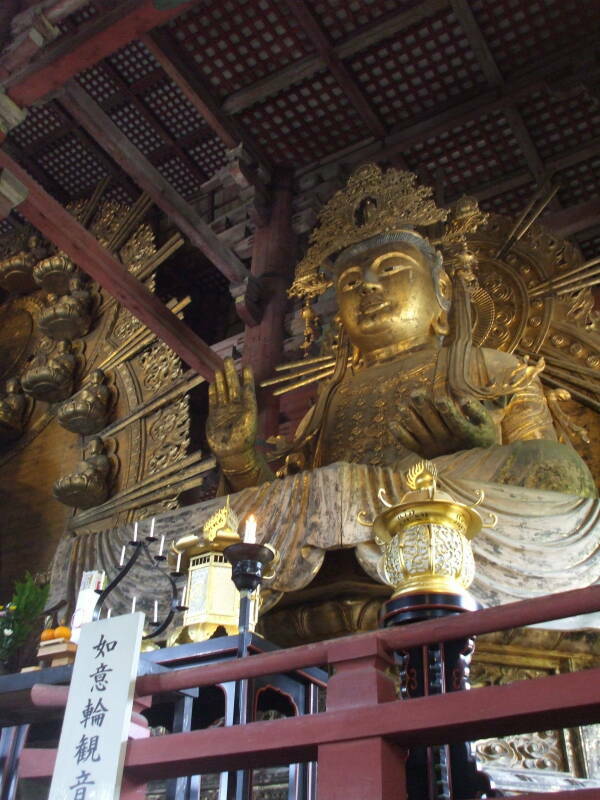 Yakushi-ji is the main temple of Hossō-shū, the oldest Buddhist sect in Japan. 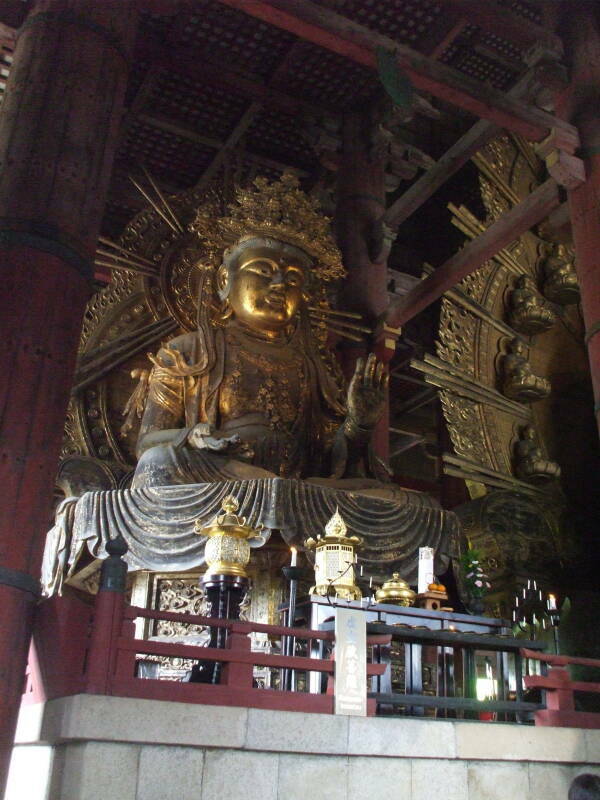 It is dedicated to Yakushi Nyorai, the Buddha of Medicine, or Bhaisajyaguru in the original Sanskrit. 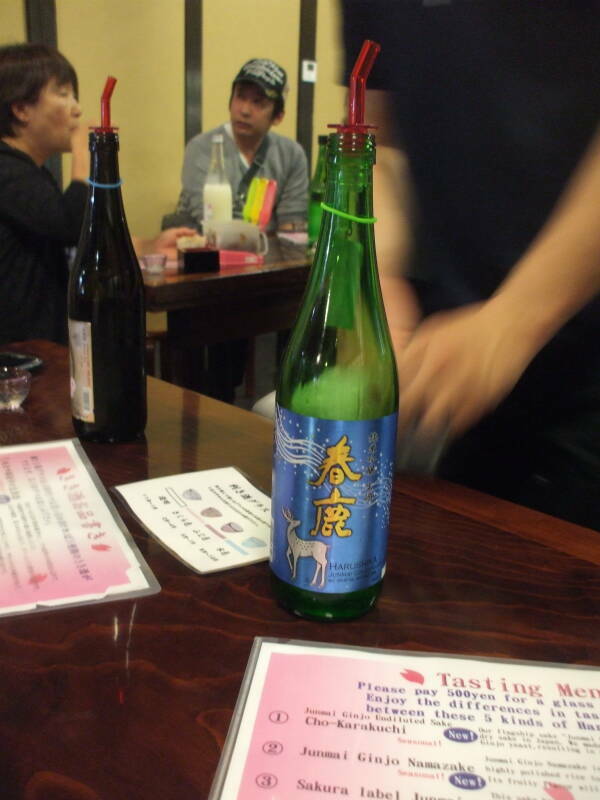 On my last day in Nara I went to the Harushika sake brewery for a tasting. 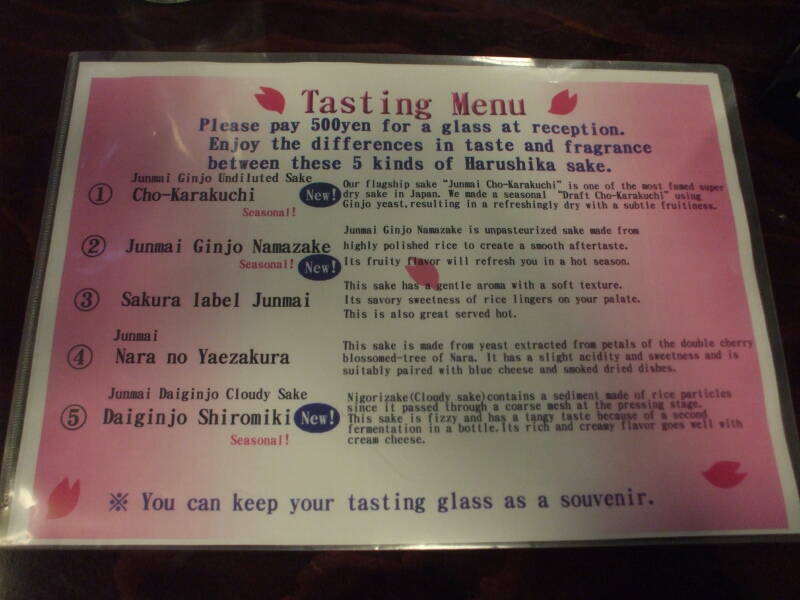 Just ¥500 to try five varieties of sake. Actually six, with a bonus added at the end. 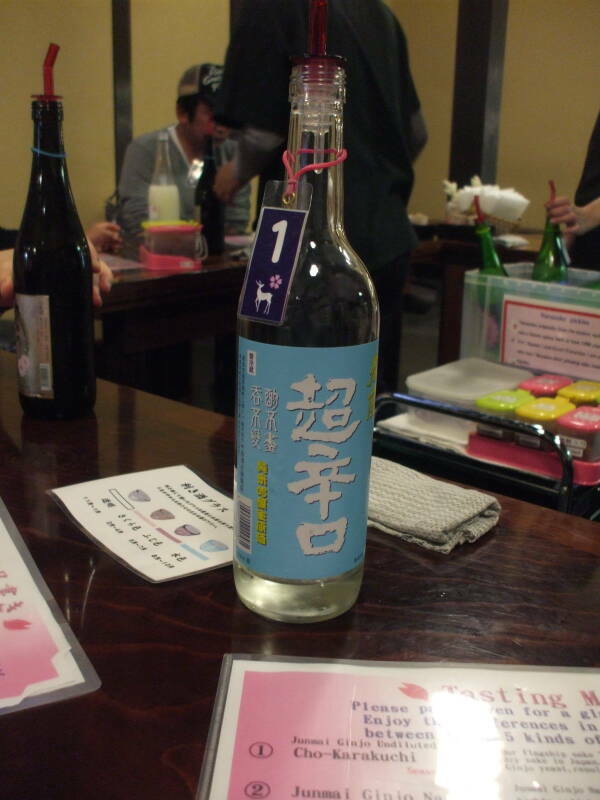 #1 Cho-Karakuchi: Our flagship sake "Junmi Cho-Karakuchi" is one of the most famed super dry sake in Japan. 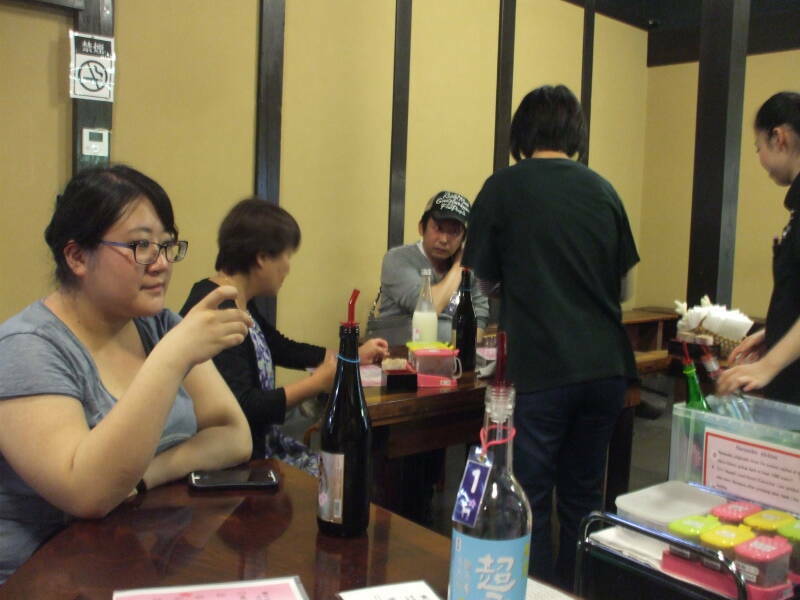 We made a seasonal "Draft Cho-Karakuchi" using Ginjo yeast, resulting in a refreshingly dry with a subtle fruitness. #2 Junmai Ginjo Namazake: Junmai Ginjo Namazake is unpasturized sake made from highly polished rice to create a smooth aftertaste. Its fruity flavor will refresh you in a hot season. 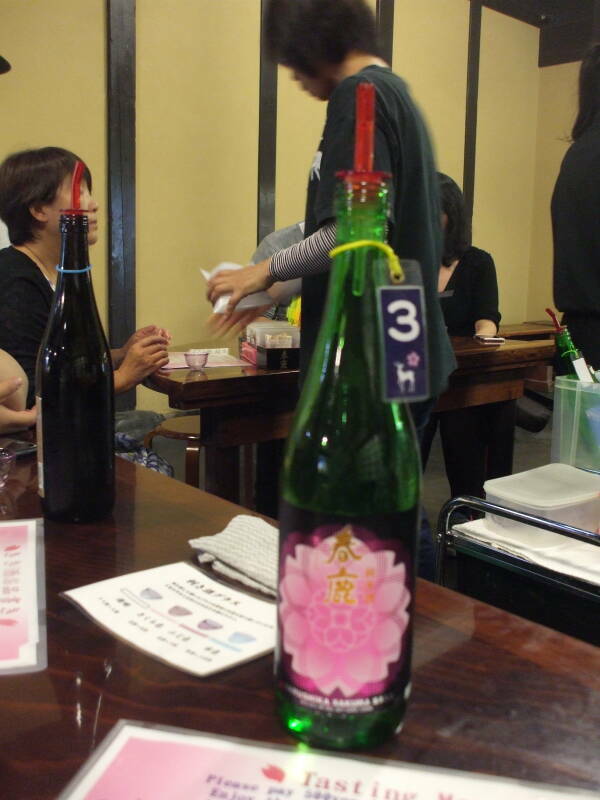 #3 Sakura label Junmai: This sake has a gentle aroma with a soft texture. Its savory sweetness of rice lingers on your palate. This is also great served hot. 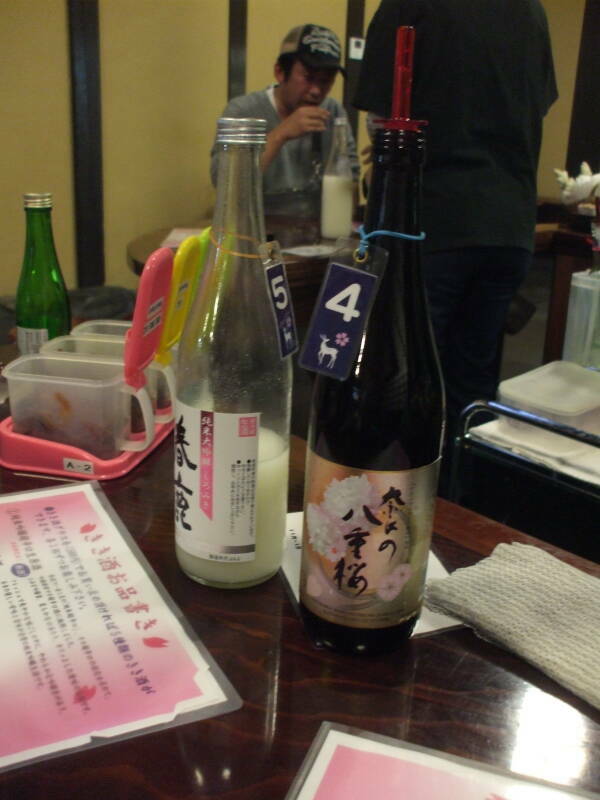 #4 Junmai Nara no Yaezakura: This sake is made from yeast extracted from petals of the double cherry blossomed-tree of Nara. It has a slight acidity and sweetness and is suitably paired with blue cheese and smoked dried dishes. #4 was the most interesting one. Its yeast from sakura or cherry blossoms made for a funky taste, like Belgian lambic with Brettanomyces yeast. 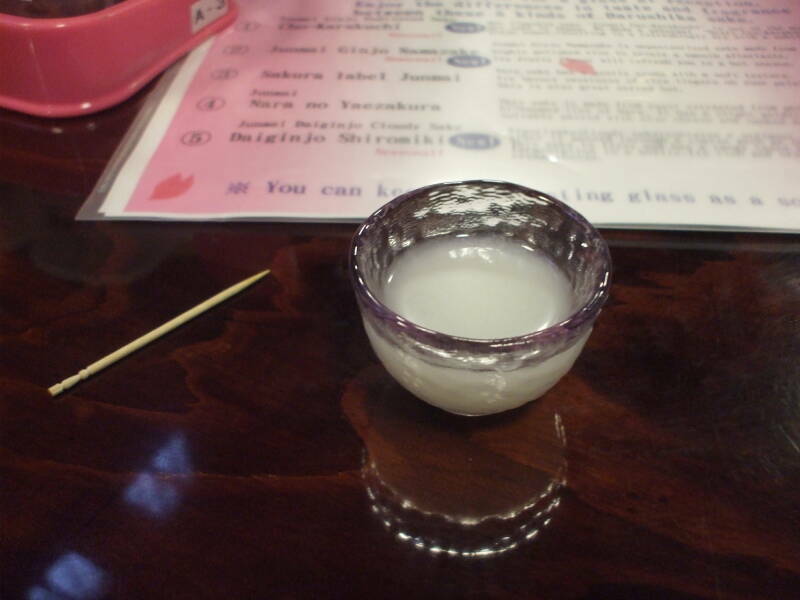 #5 Junmay Daiginjo Cloudy Sake: Daiginjo Shiromiki: Nigorizake (Cloudy sake) contains a sediment made of rice particles since it passed through a coarse mesh at the pressing stage. 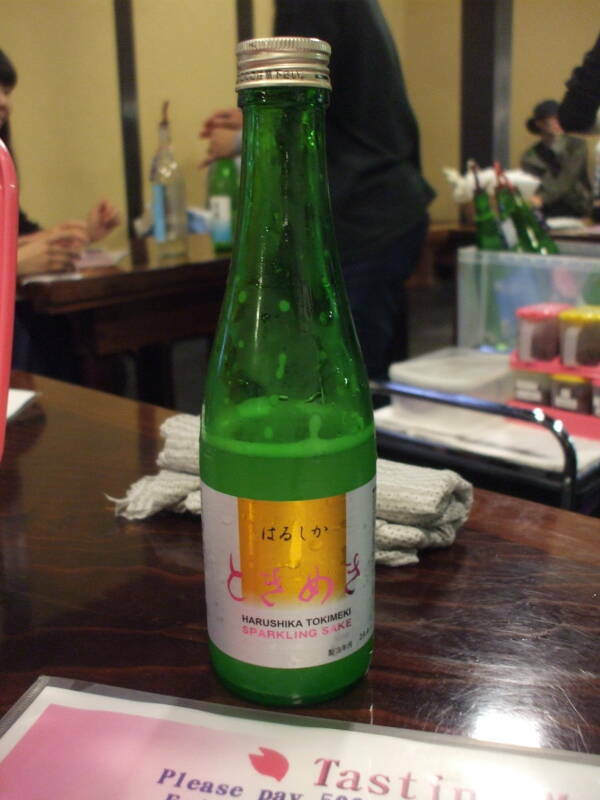 The sake is fizzy and has a tangy taste because of a second fermentation in a bottle. Its rich and creamy flavor goes well with cream cheese. There were small bites as palate cleansers between the samples. 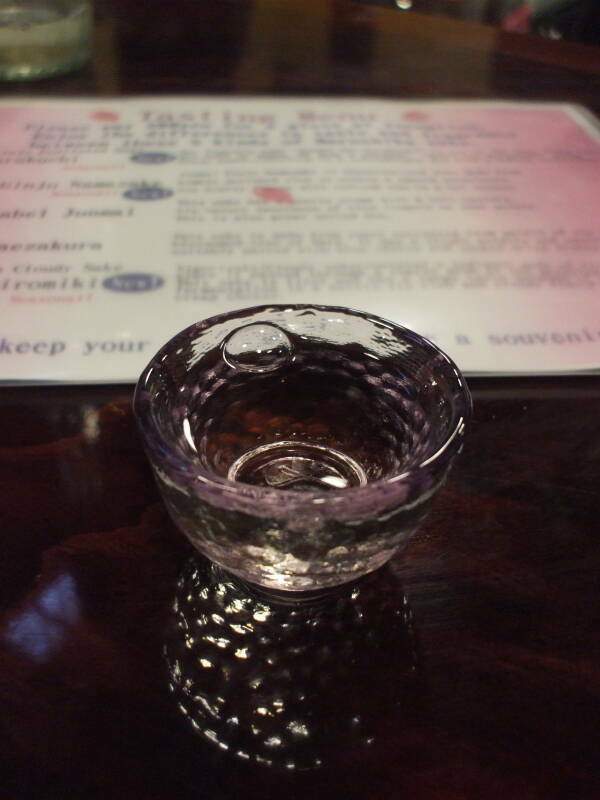 Then a bonus sixth round, Harushika Tokimeki, a sparkling sake. Finally it was time to leave Nara. 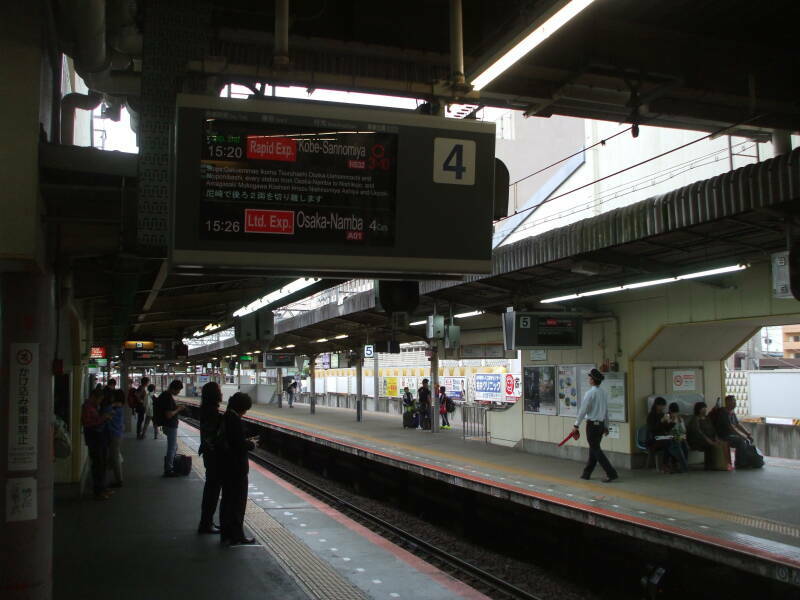 I took the Kintetsu line from the station in town to the Yamato-Saidaiji station with connections to the north, west, and south. The schedules aren't that hard to figure out. 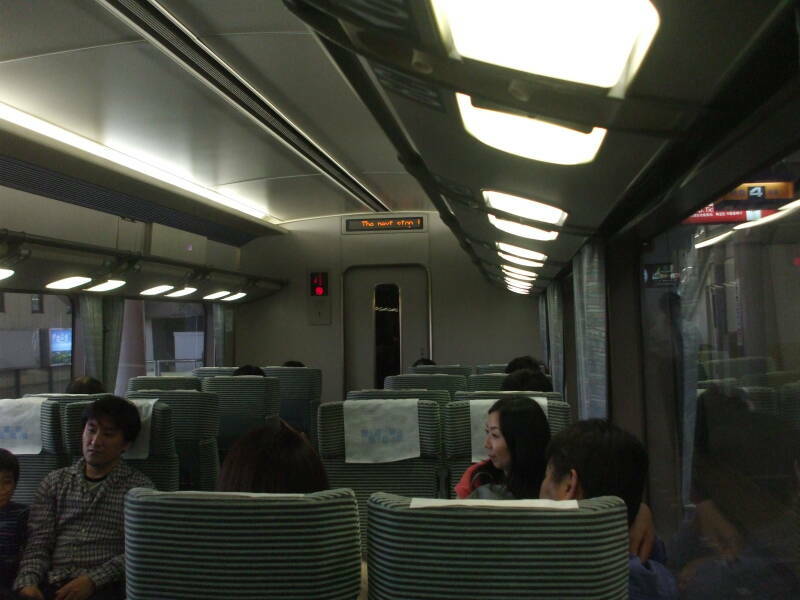 I got a Limited Express ticket for Ōsaka Namba station. Before long we came out of the tunnel through the line of hills west of Nara. 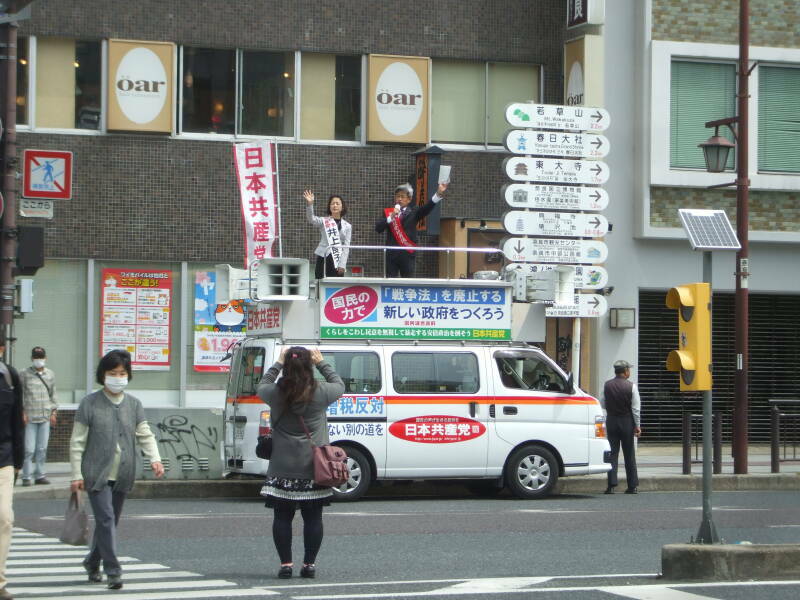 All at once we were in the outskirts of Ōsaka. I saw several kofun around Nara, use the links immediately below to explore those prehistoric megalithic burial mounds, starting with the Kofun of Emperor Kaika in the center of Nara. Or, jump ahead to Ōsaka. 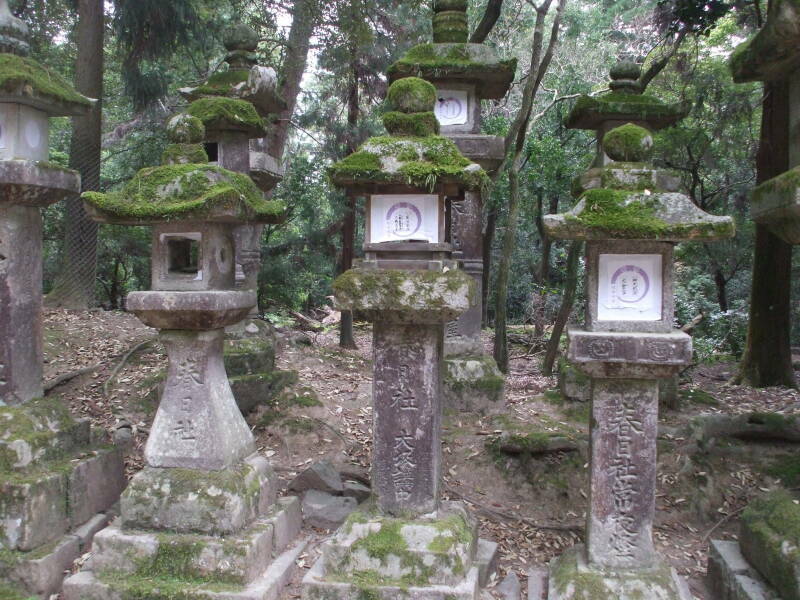 The above is specific to the kofun, the megalithic burial mounds around Nara. 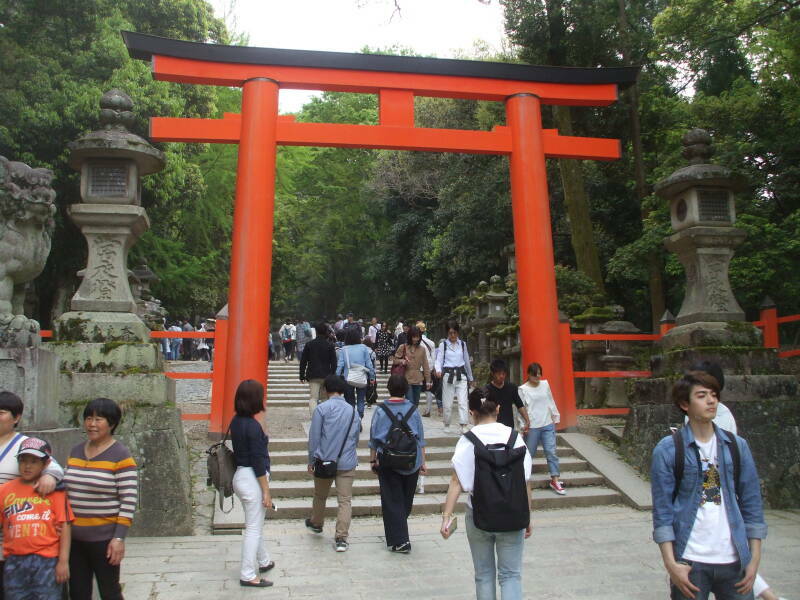 Or maybe you want to explore other places in Japan.